So many things to do and so many new places to explore, we don’t want to forget anything. We chatted about our experiences on the flights back to Denver. 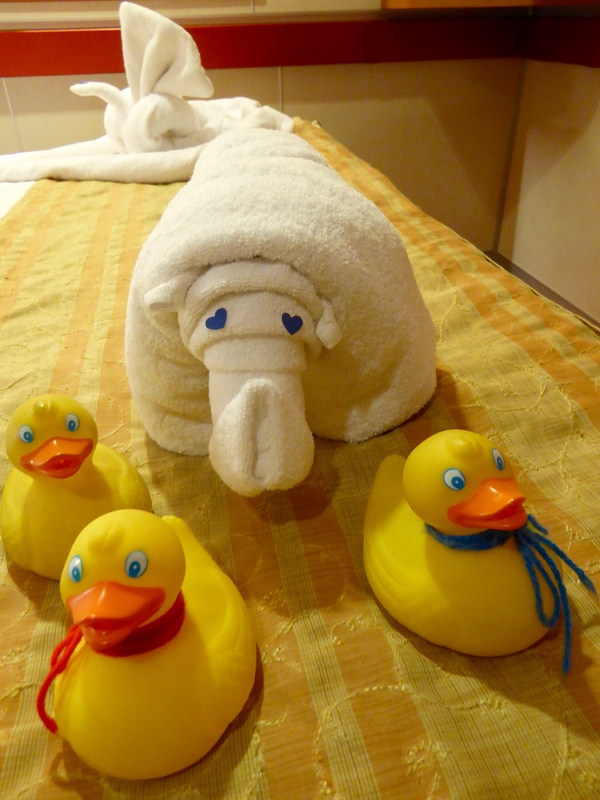 The first day we ducks met our new friend, Chip, from Hilton Doubletree hotels. 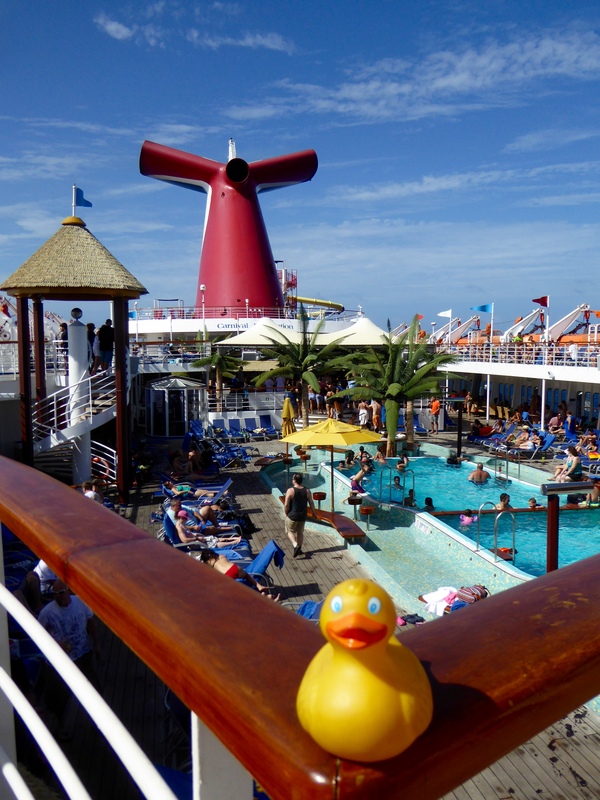 On our cruise ship, Carnival Fascination, Zeb surveys his kingdom. 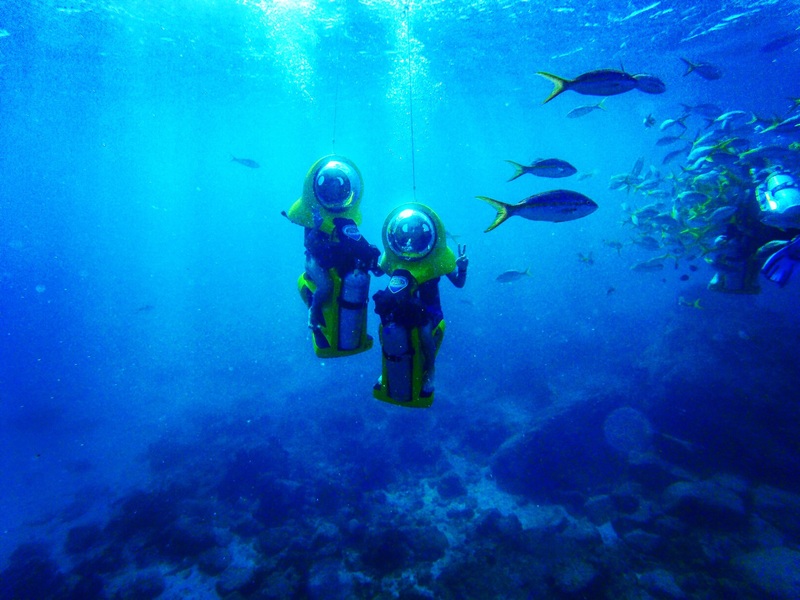 Then in St. Thomas, Bucket and his parents ride underwater scooters. Barbados provided the shopping highlight. 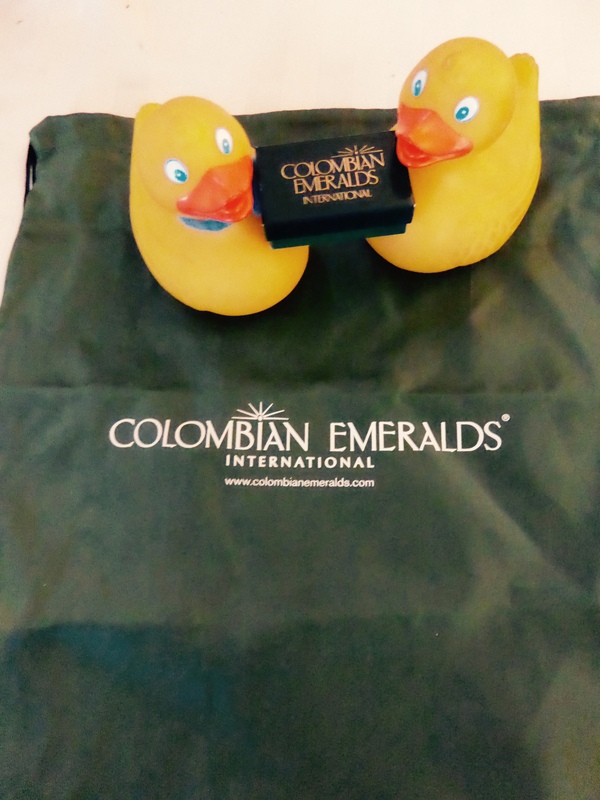 Maybe this bag is new traveling bag for ducks. Humans get the emeralds. 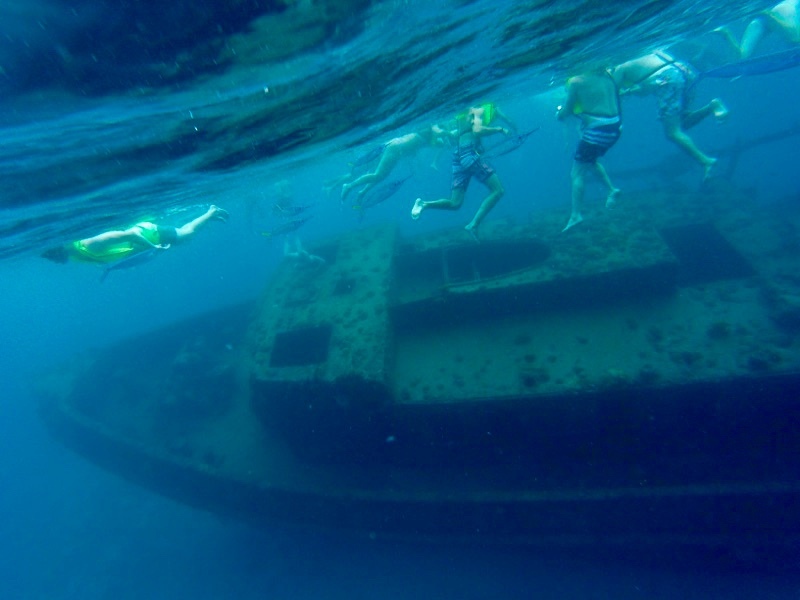 Also Barbados was where Bucket and his parents snorkeled and saw an underwater wreck. 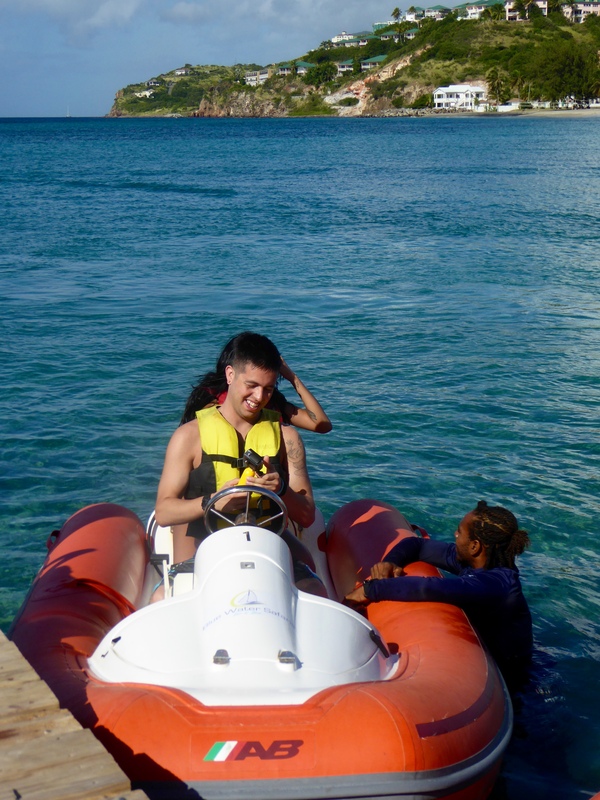 St. Kitts had us all in mini speedboats. Bucket and his parents almost ready to head out. Then Soapy’s mom discovered a monkey and the monkey’s owner discovered Soapy’s mom. Was fun for everybody here. 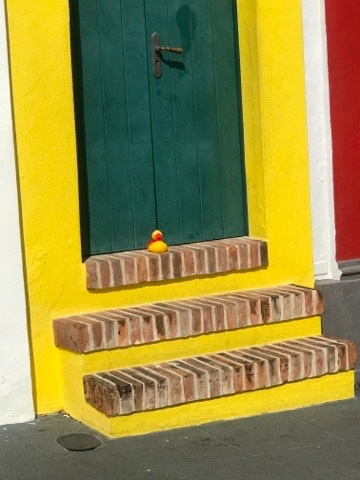 St. Lucia almost ended the Colorado Traveling Ducks. Are we swimming alone? Mom!! Out to sea we went, but Bucket’s mom saved us! 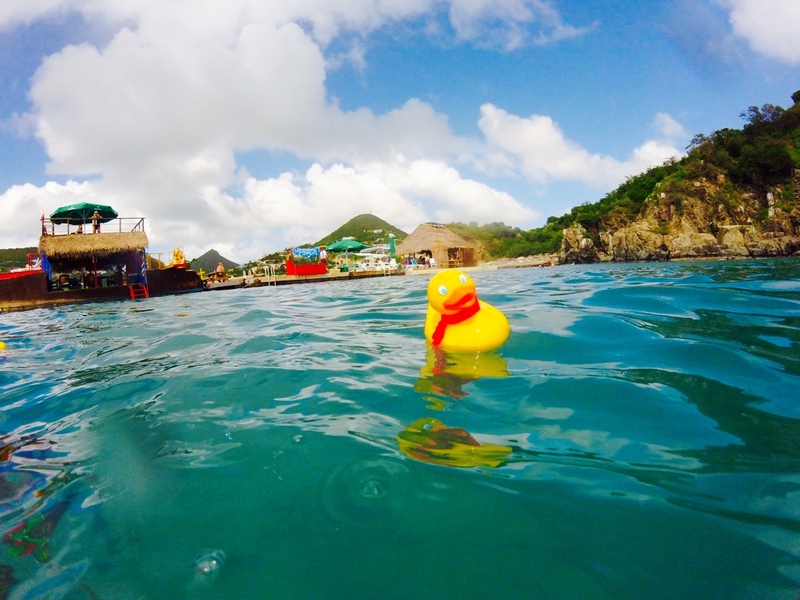 In St. Maarten, Bucket, the daredevil that he is, went swimming alone. He said he had fun and needed to get away from all of us. Bucket’s mom saved him, too. Bucket’s mom plays and get ready to do some fancy jumping into the water. 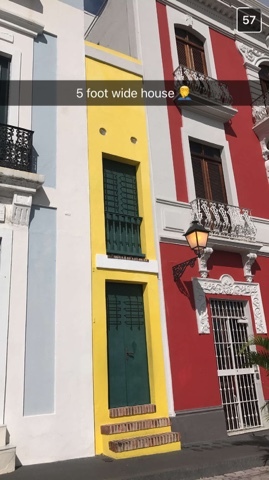 Puerto Rico displayed the really small house. 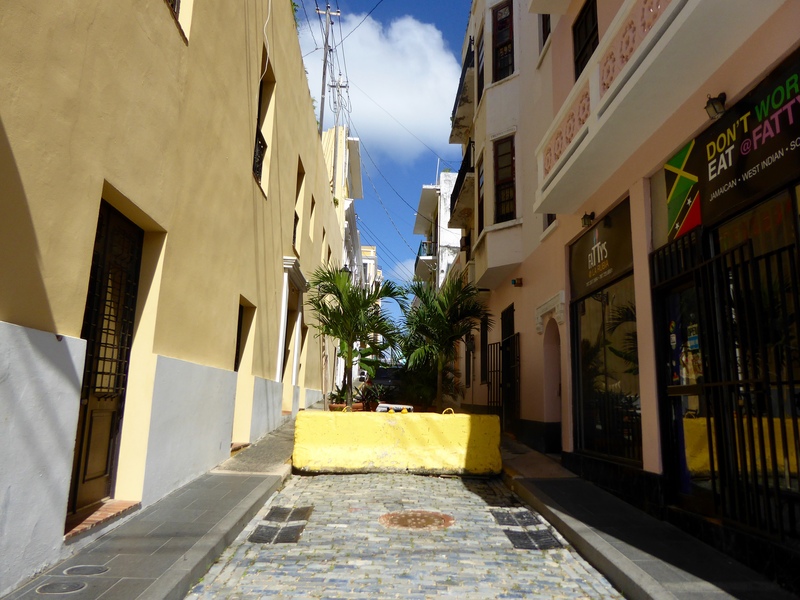 Narrow streets were fun to explore in Old San Juan. 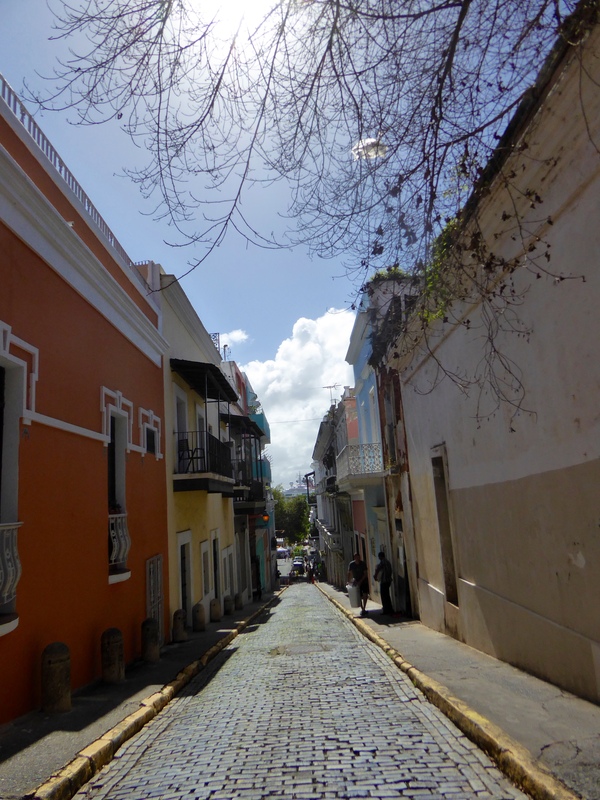 Narrow streets of Old San Juan. Let’s go down this street. 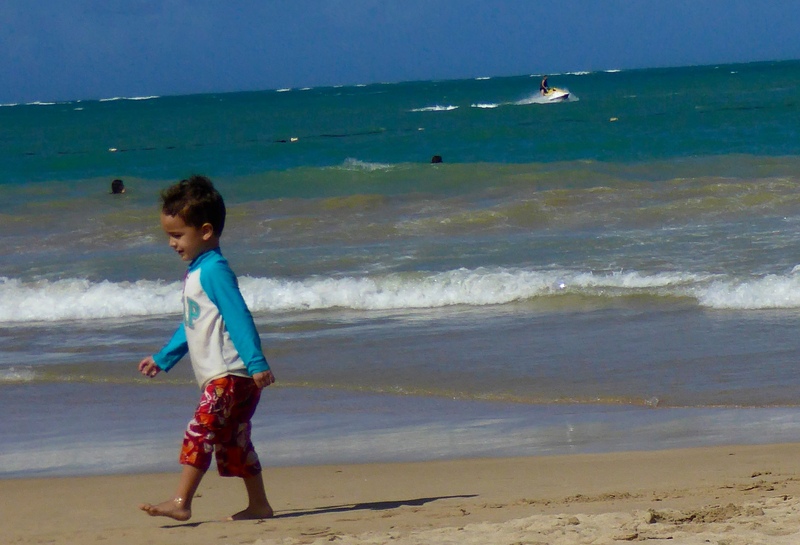 Of course we visited many beaches, but this one, Isla Verde in Puerto Rico was the last. Every night we were blessed with beautiful sunsets. This was a vacation to remember. We saw and did many things, and we were all together. We hope you enjoy family vacations also. We are going to the beach! 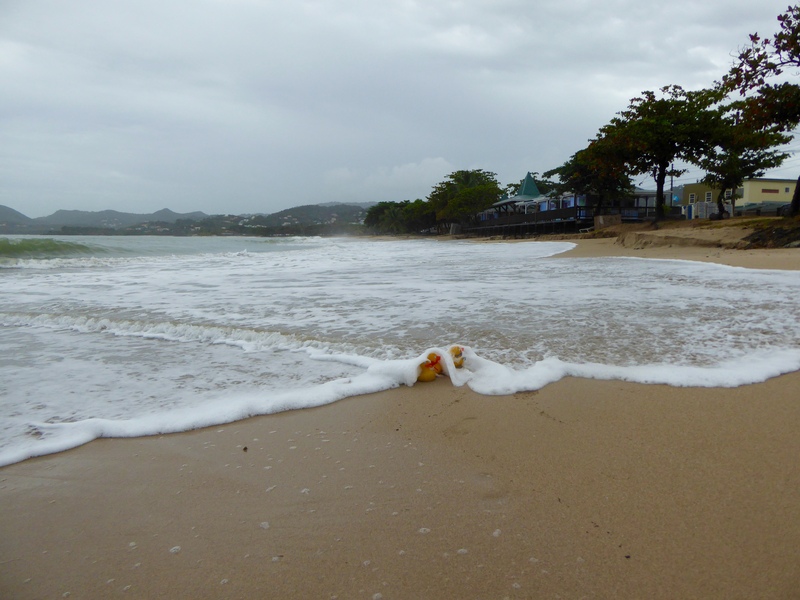 We ducks love all the activities and exploring in old towns, but the beach is our favorite. 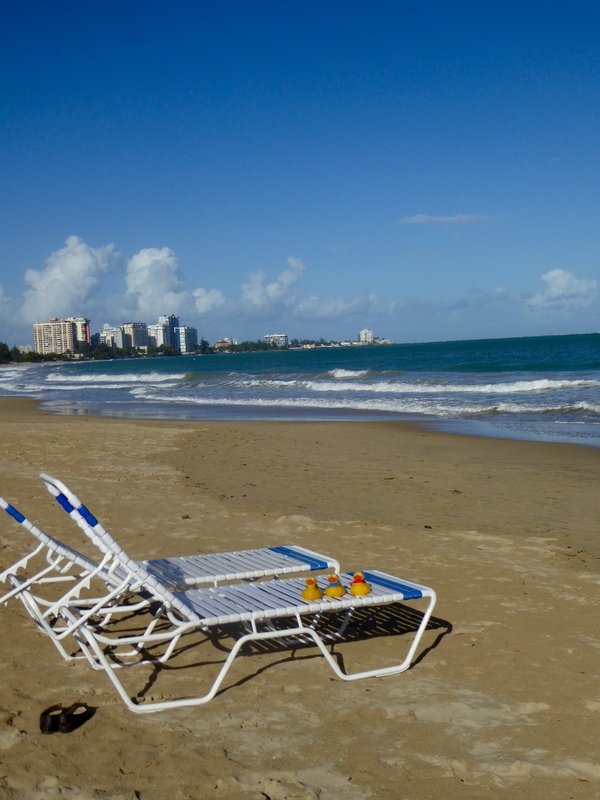 Isla Verde Beach is our place today. 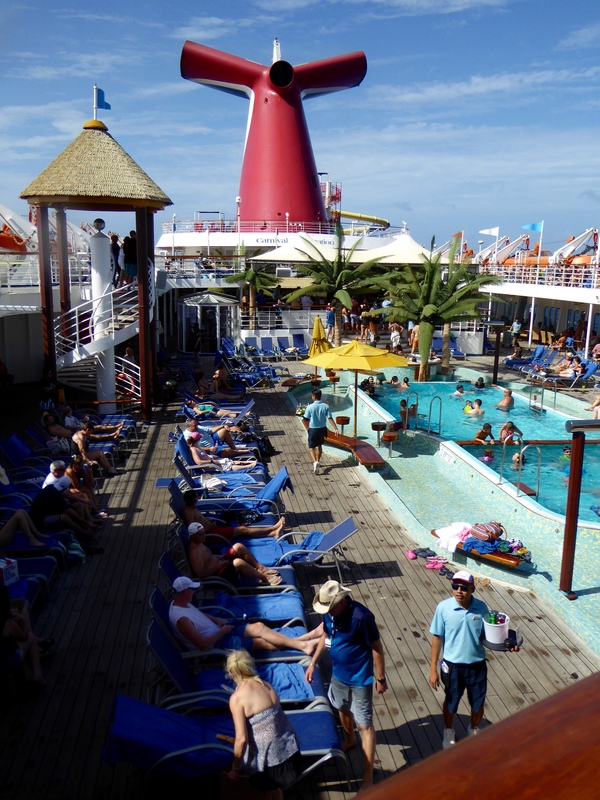 First we rent beach lounge chairs and umbrellas. We have never seen this. 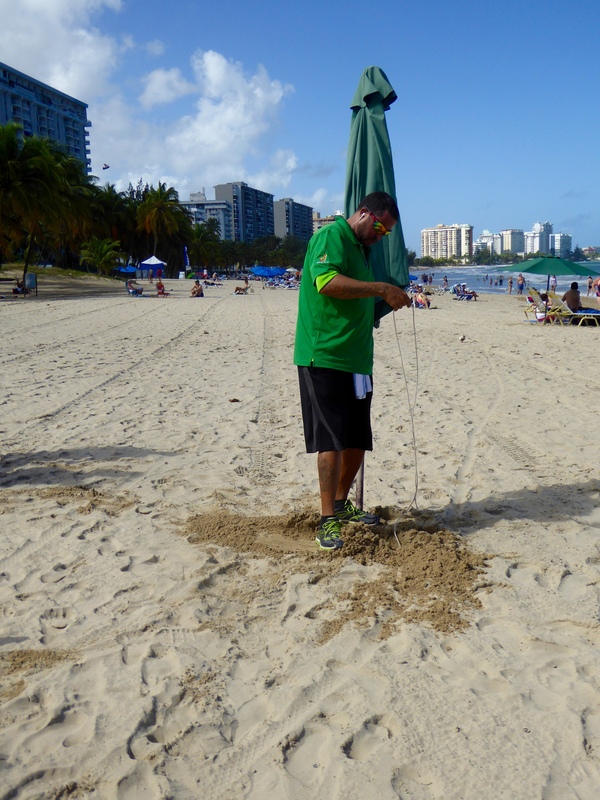 We pick our spot on the beach and the gentleman uses a drill with a wide, long attachment to dig a hole to secure our umbrella in the sand. 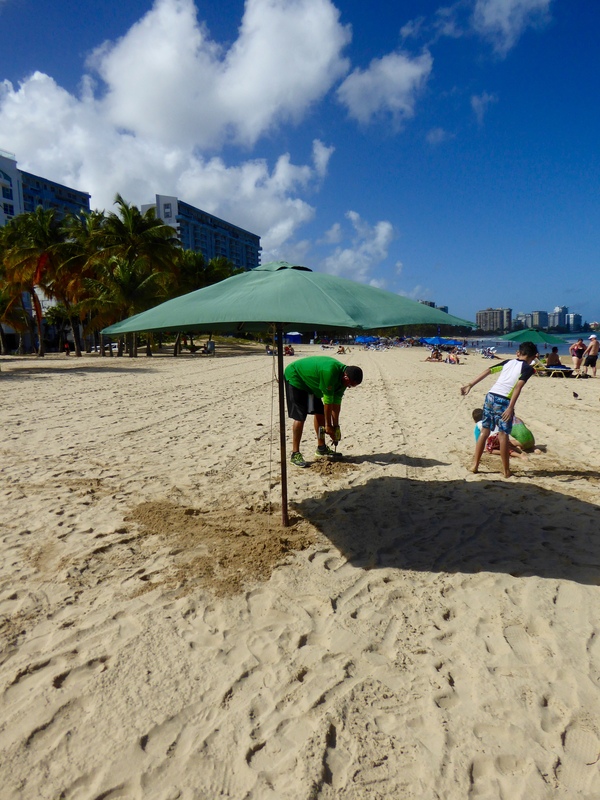 Now the umbrella is firmly anchored in the sand, but extra ropes are needed to protect our umbrella from the wind. Since we needed two umbrellas and four chairs, how did he carry them to our favorite spot? 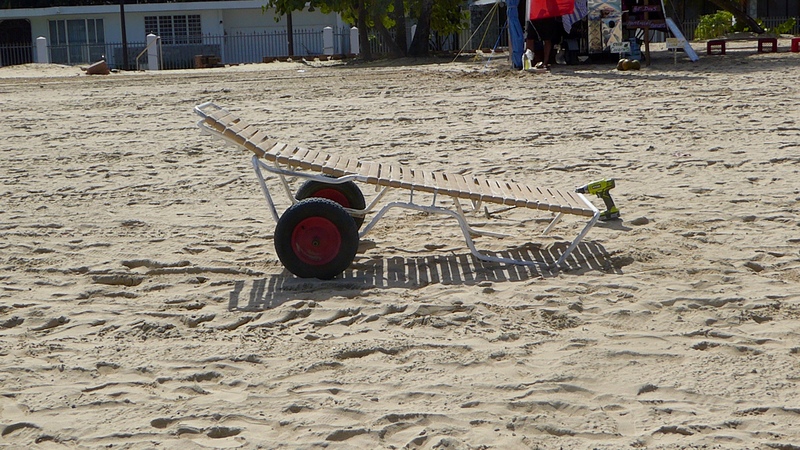 On this lounge chair, adapted with large sand wheels. You can also see the drill and long attachment behind the carrying chair. This man really knows what he is doing. 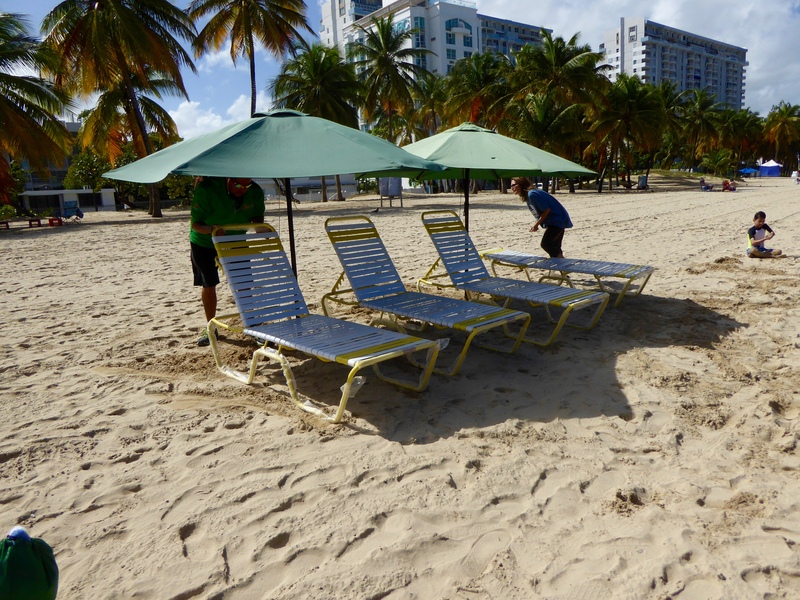 The chairs are arranged, water bottles available, and we are ready for a day of sun, sand, water and fun. Sitting on the beach, we enjoy the soft sand. Time to rent jet skis now. Jet skis are so much fun. Each human gets a separate jet ski. It is more fun to drive. Here is Bucket’s dad driving his jet ski. 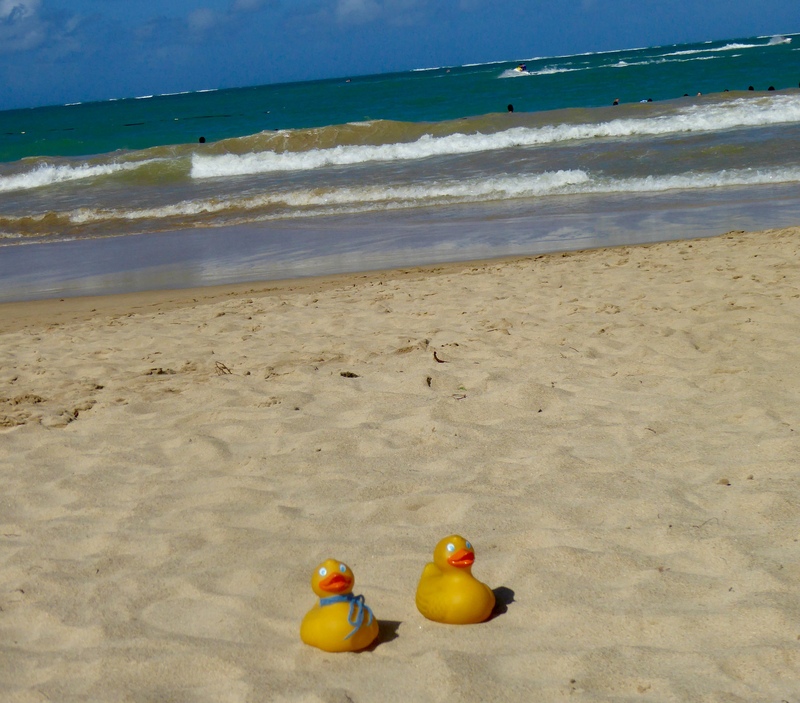 Warm sun and beach activities do make humans and duck hungry and thirsty. Not to worry. 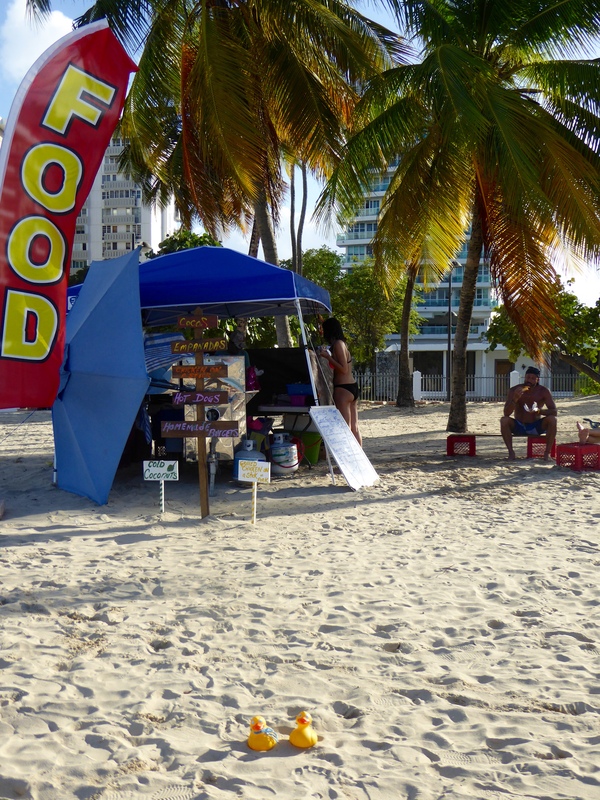 A food stand is right behind us on the beach. We have a lot of food now, so Bucket’s mom is sharing with some new friends. 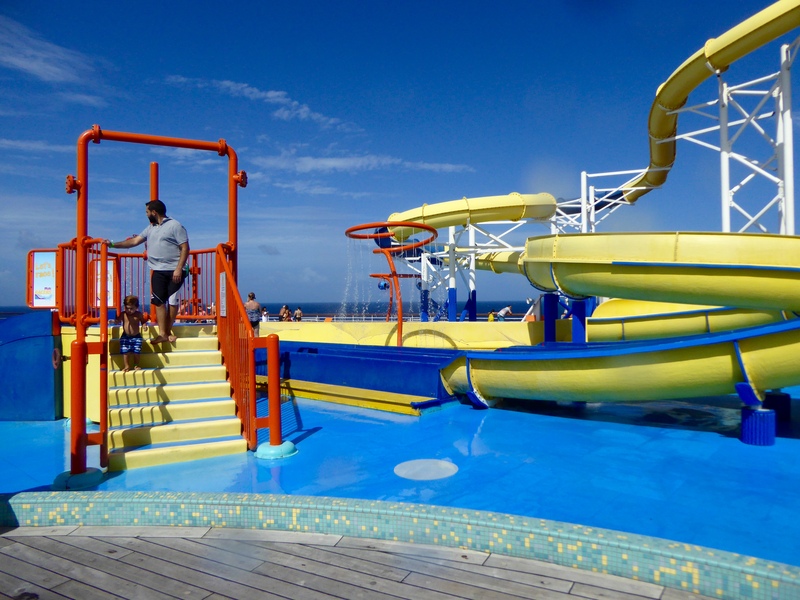 There are many water activities available at the beach. 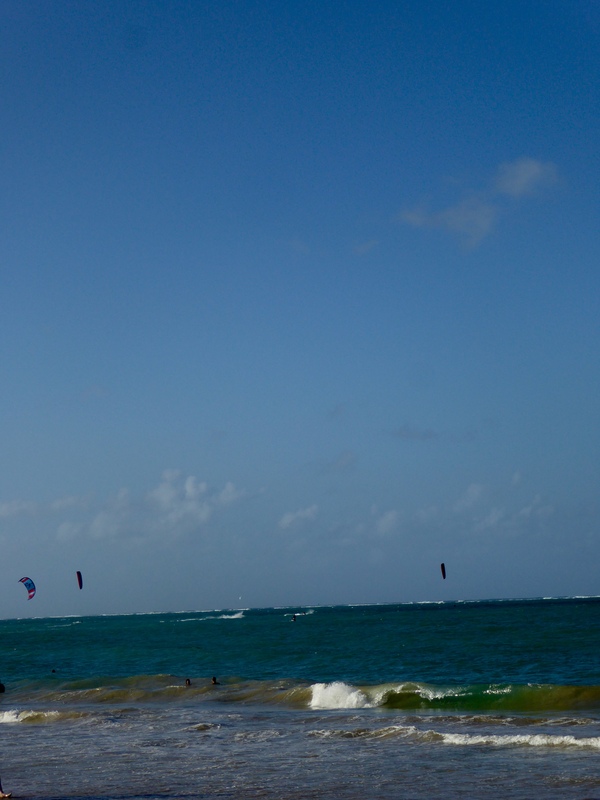 These are kite boards. The kites are so colorful and look great sailing above the water. We did not try them today. Maybe another time. 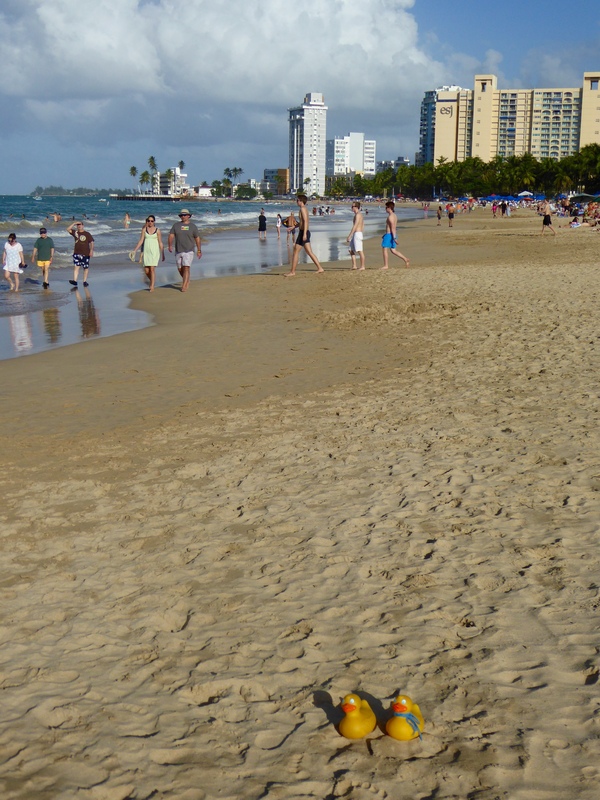 You can see there are many people enjoying Isla Verde Beach today, but it really is not crowded. This is a big beach. 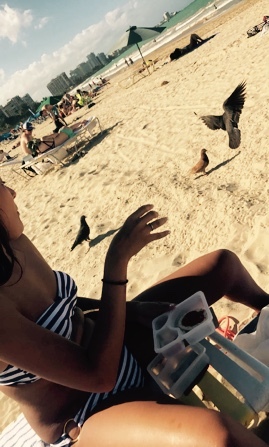 This is our last day in Puerto Rico so we are all happy to spend it at the beach. But we are getting hungry again. 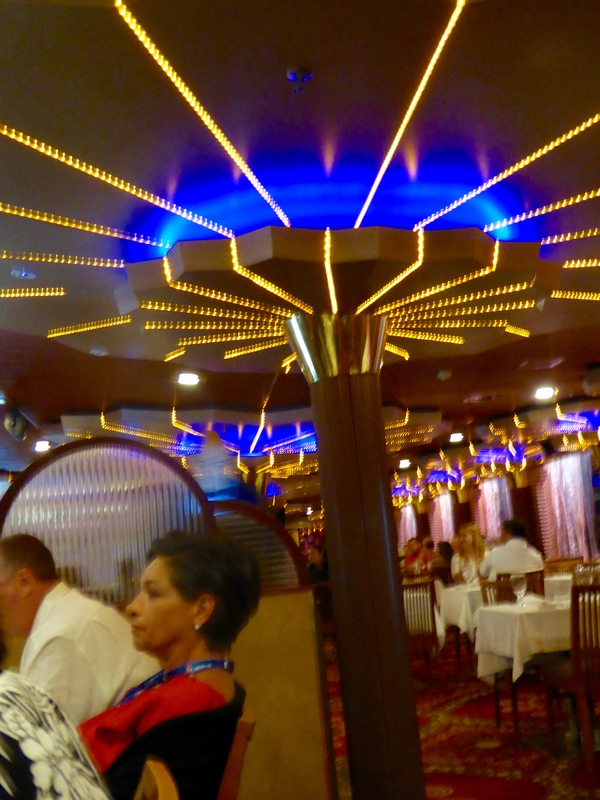 Let’s try some real Puerto Rican food for our last evening. 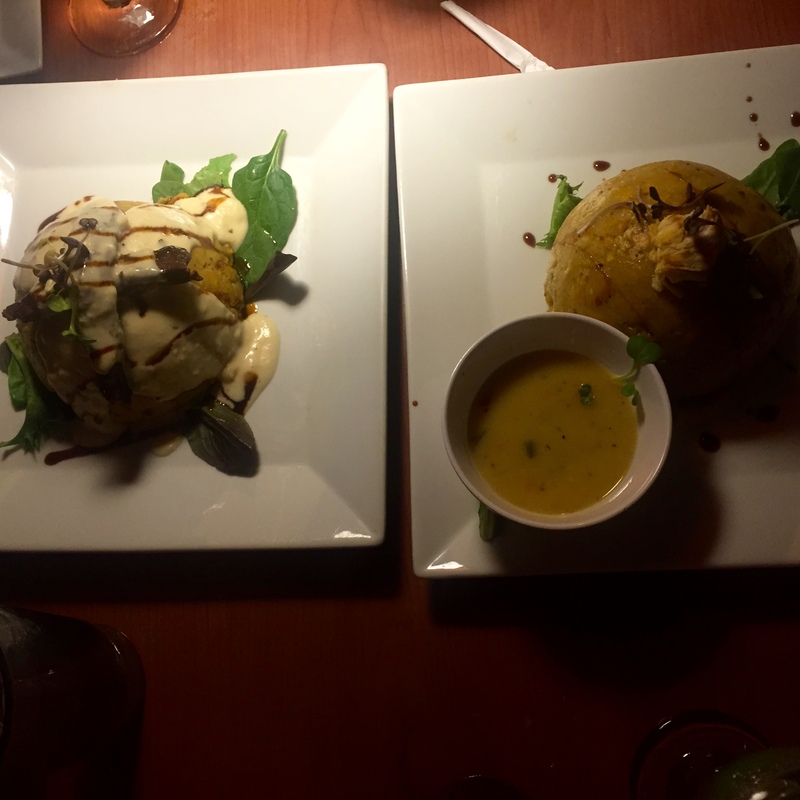 Nearby at Los Platos restaurant, we order mofongos. These are green mashed plantains. One has chicken inside and one has beef inside. We have a choice of white garlic sauce or Puerto Rican creole. We tried each sauce. Three of us had mofongos and one had a delicious fish dinner. This meal was very tasty and a great way to end our Puerto Rican vacation. 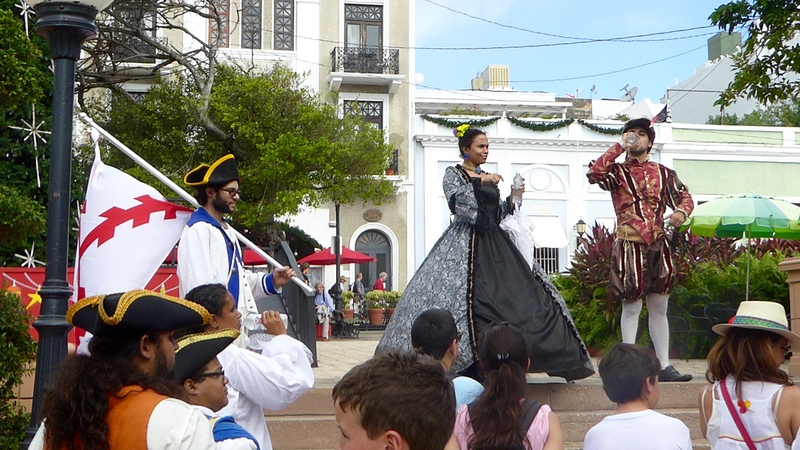 Here, in the Plaza de Colon in Old San Juan we found Ponce de Leon, the first governor of Puerto Rico. 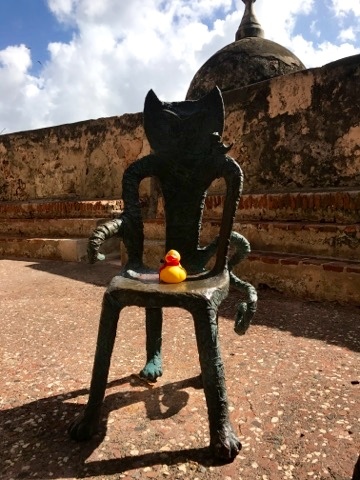 Searching for the Fountain of Youth, in Puerto Rico and in the American state of Florida, today he is promoting benefits of drinking clean water. It must work, he was born in 1474 and he looks pretty good. 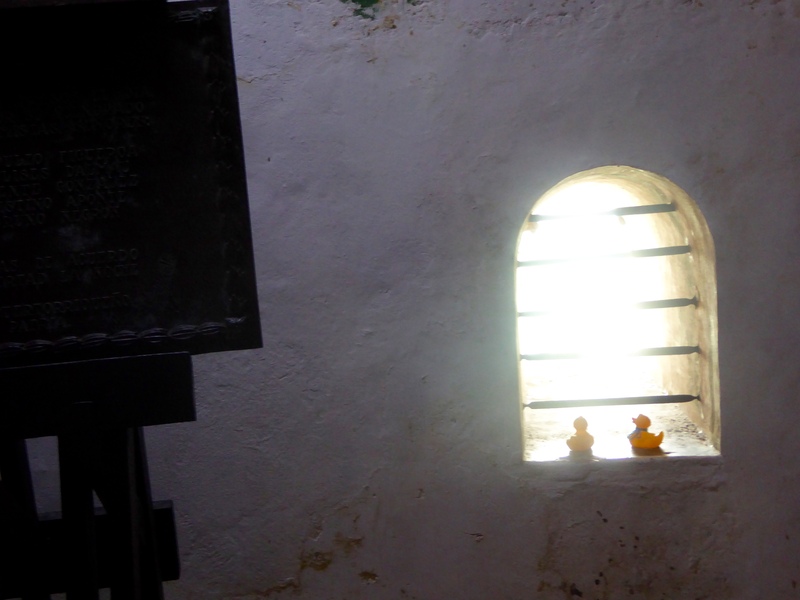 A short walk took us to the Franciscan Chapel, built by the Third Order of Saint Francis. 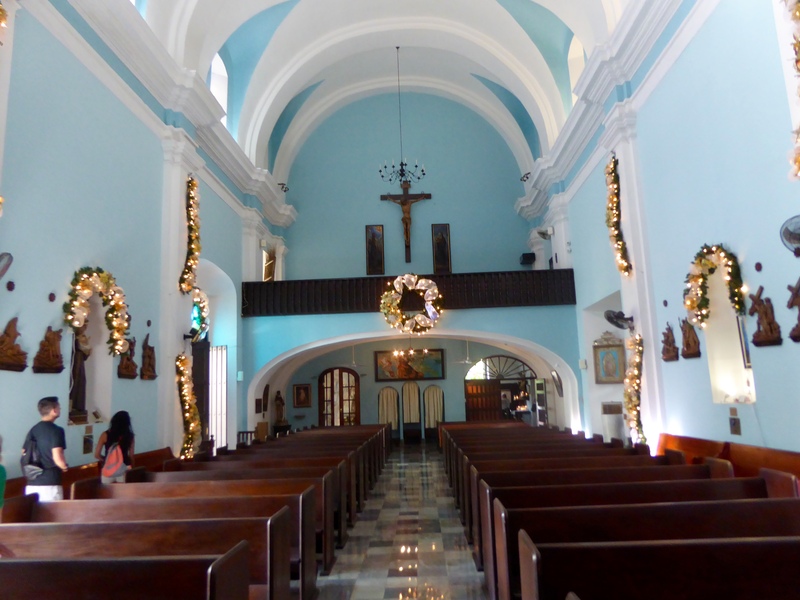 This is not the most popular church, so it was almost empty. But so beautiful and made humans and ducks feel at peace. 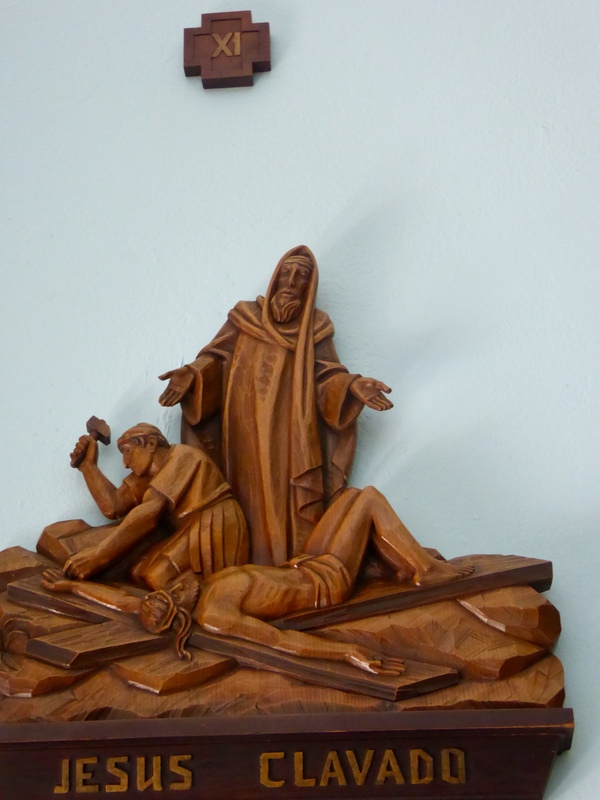 On the walls, the Stations of the Cross, were intricately carved. This is number 11, the nailing of Jesus to the cross. 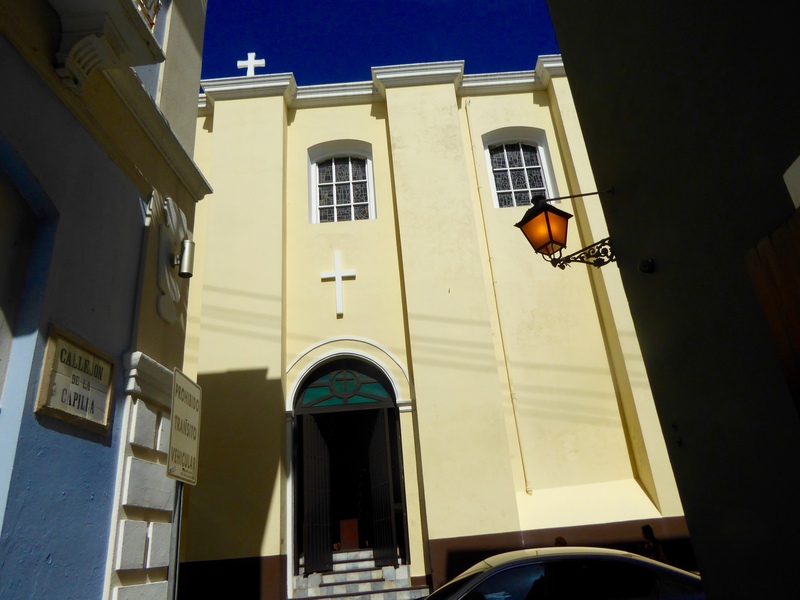 Much of Old San Juan features restaurants and tourist shops. But, it is part of the city and many people live here. From the 1500s, the cobblestone streets are quite narrow. The humans just wanted to wander down these streets, not wanting to eat or shop now. 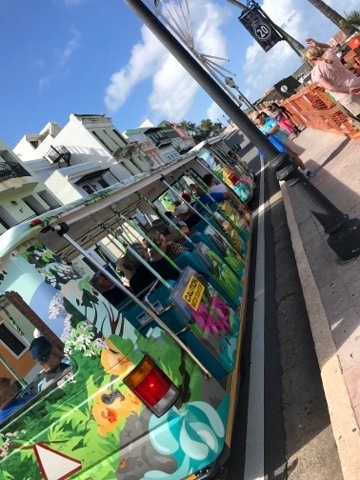 On the main, wider streets, tourist buses take people between the two Spanish Castillos that we previously showed you. 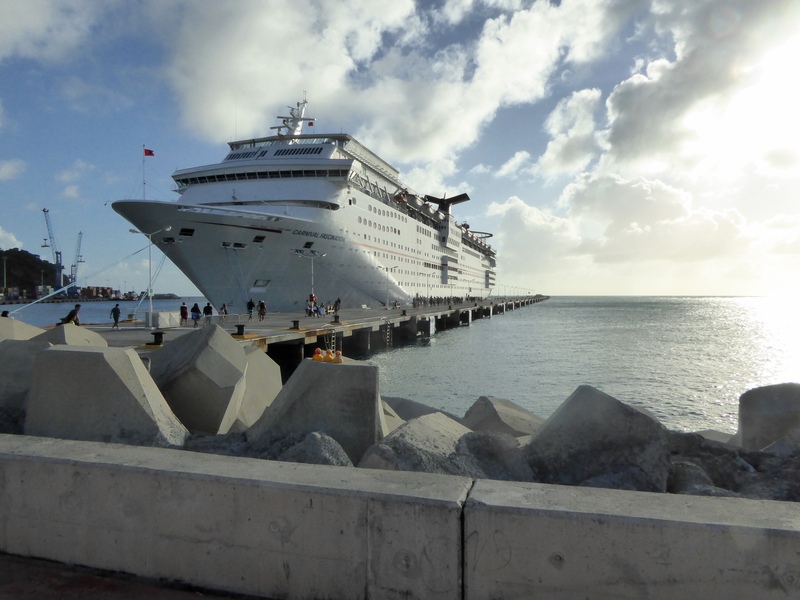 Also taking humans to the cruise port. Yes, the cruise ships leave from this area also. Look at the decorations on this bus. 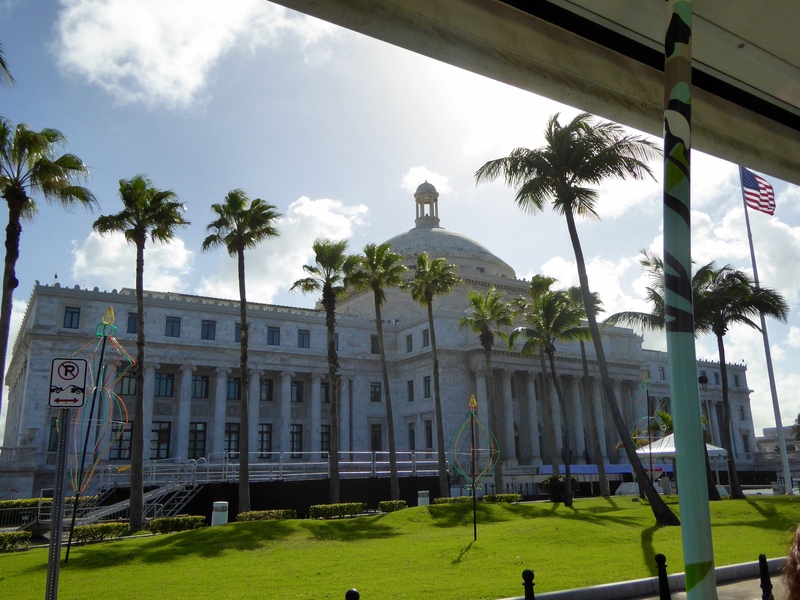 From the bus, we saw the government building for the Commonwealth of Puerto Rico, flying the flag of the United States of America. Some people in the world are trying to reduce their life, their possessions, and reduce their carbon footprints. This house does that. This little house is only 5 feet wide. That really is little. Not everybody wants to live in a space that small though. On this narrow street, the apartments are fairly small, but the curved balconies seem wonderful. And, no buses on this street. 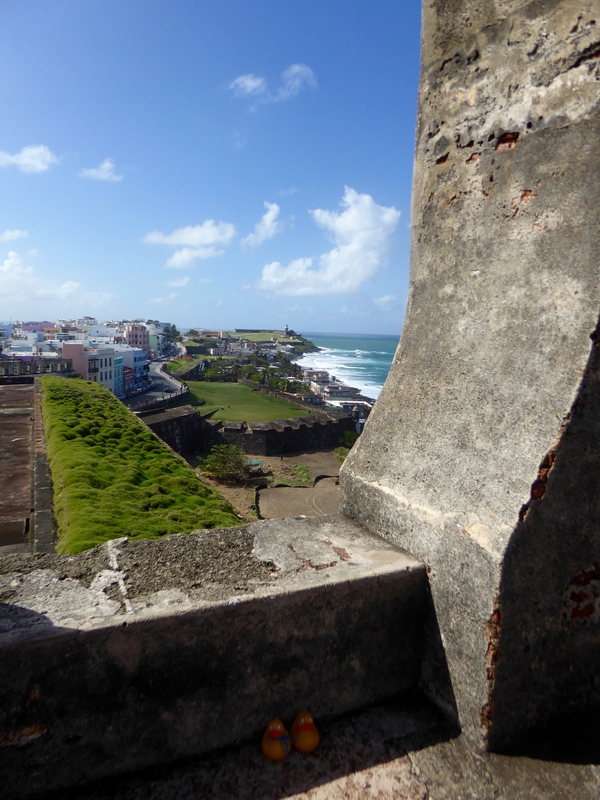 You could spend several days exploring Old San Juan, but we were only here for one day. We loved it, but we wanted to go to the beach. We will take you there next time. 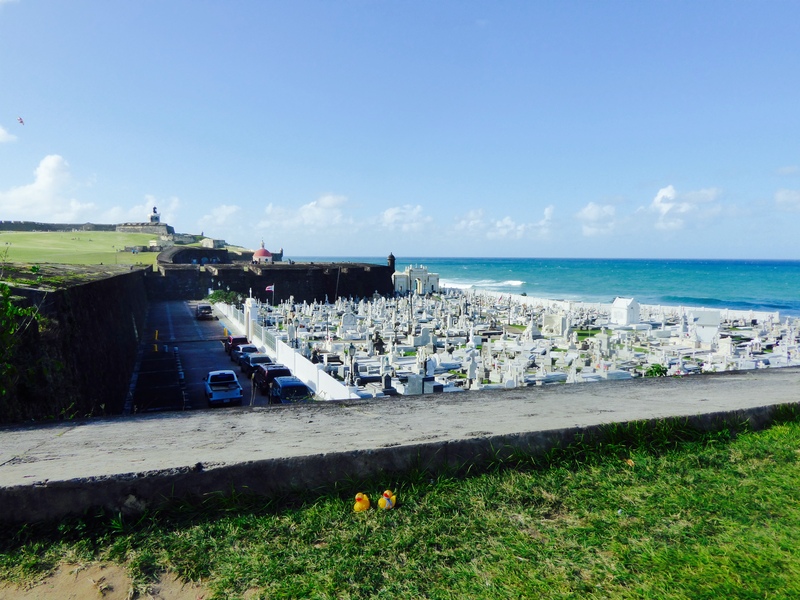 We are loving our time in Puerto Rico. 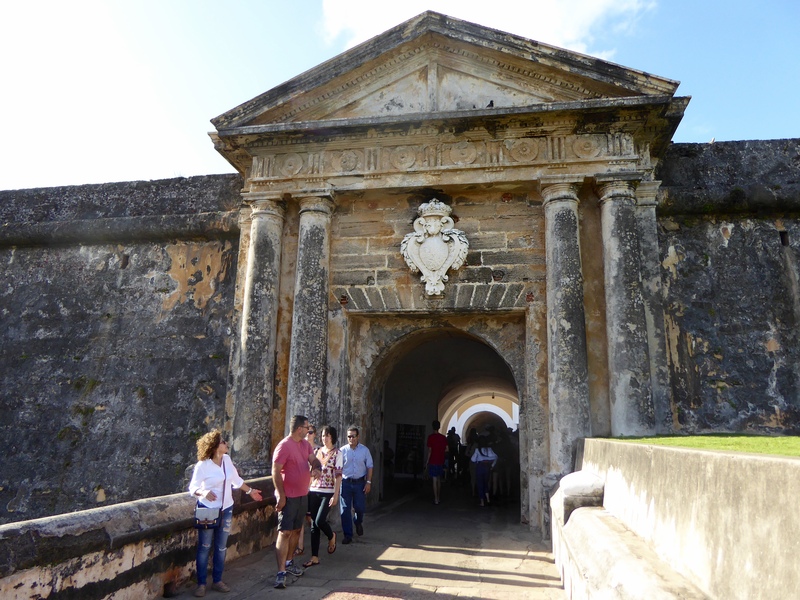 Last time we showed you Castillo San Felipe del Morro, the Spanish defense from sea attacks. 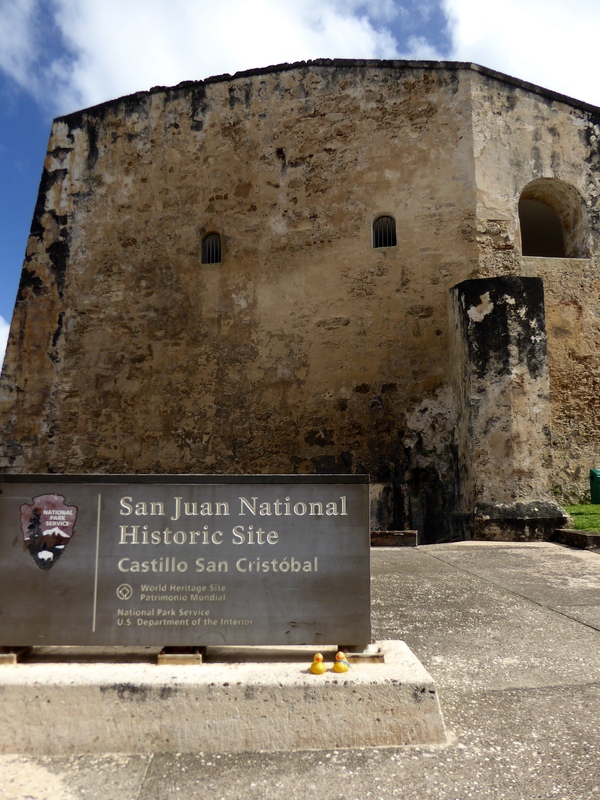 Now we will show you Castillo San Cristobal, the Spanish defense from land attacks. 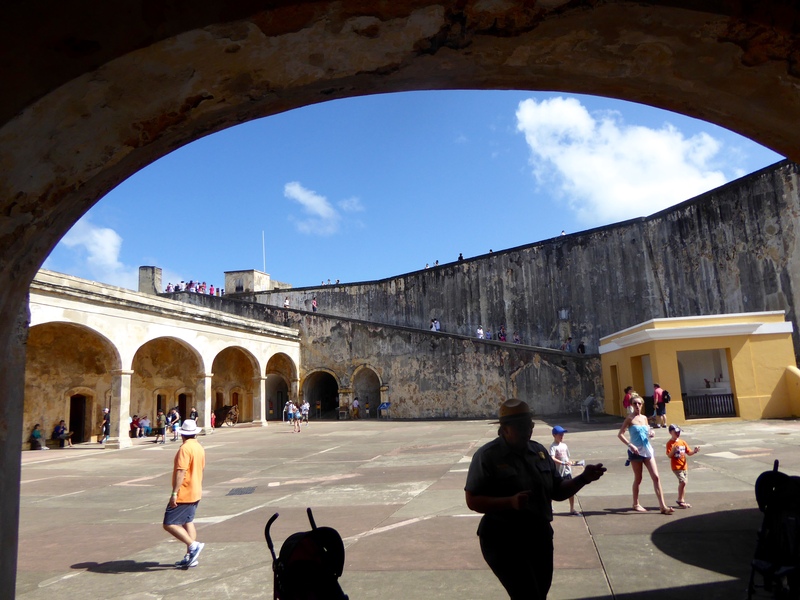 This was the biggest European fortification in the Americas. 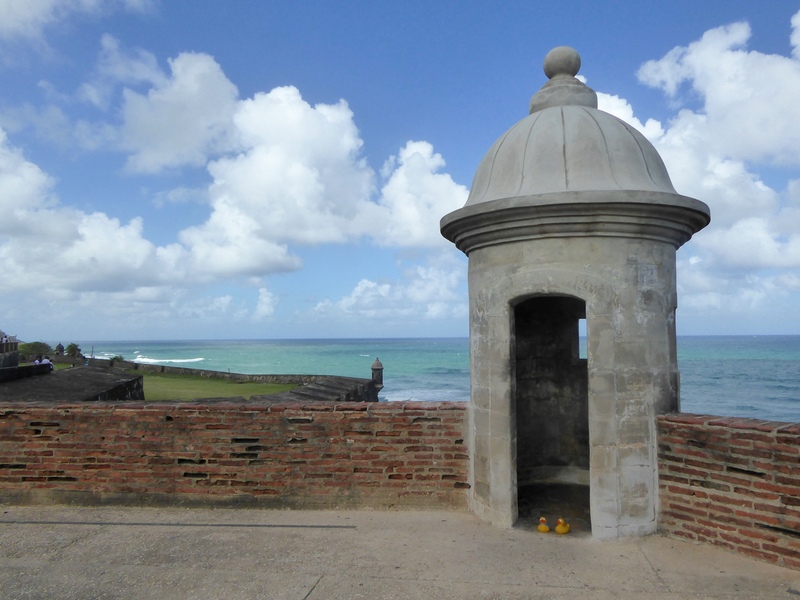 Canons were once housed here, to defend the Spanish claim to Puerto Rico. Let’s walk up this incline and enter the fortress. 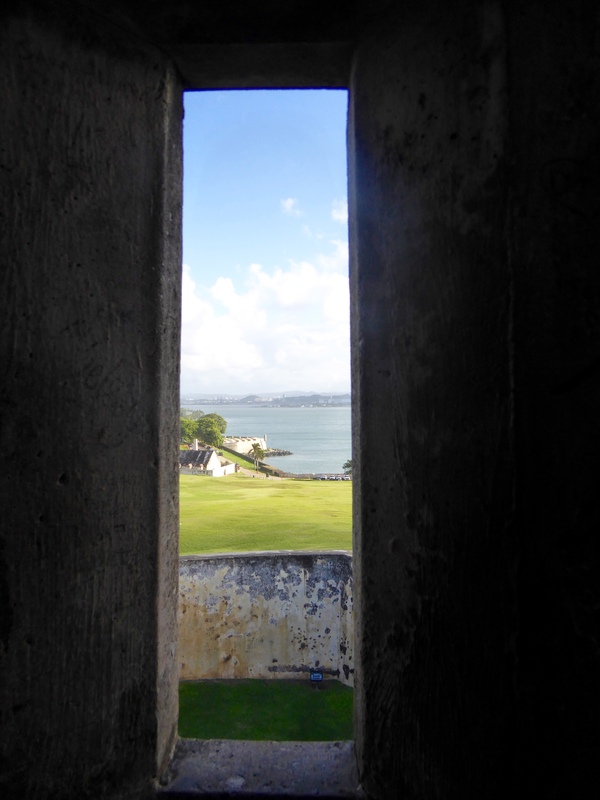 Looking to the sea, this fortress offered an advantageous view of the sea and the land. 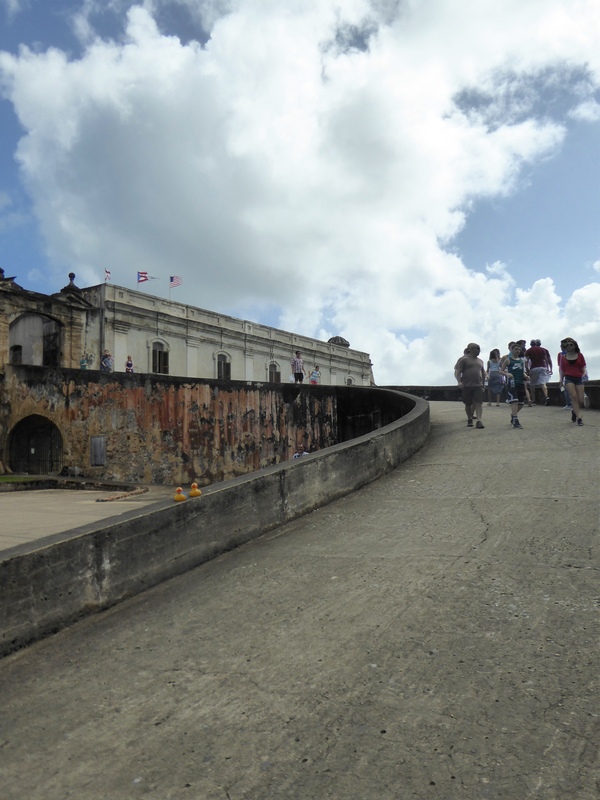 As we enter Castillo San Cristobal, we notice we will be climbing more inclines. 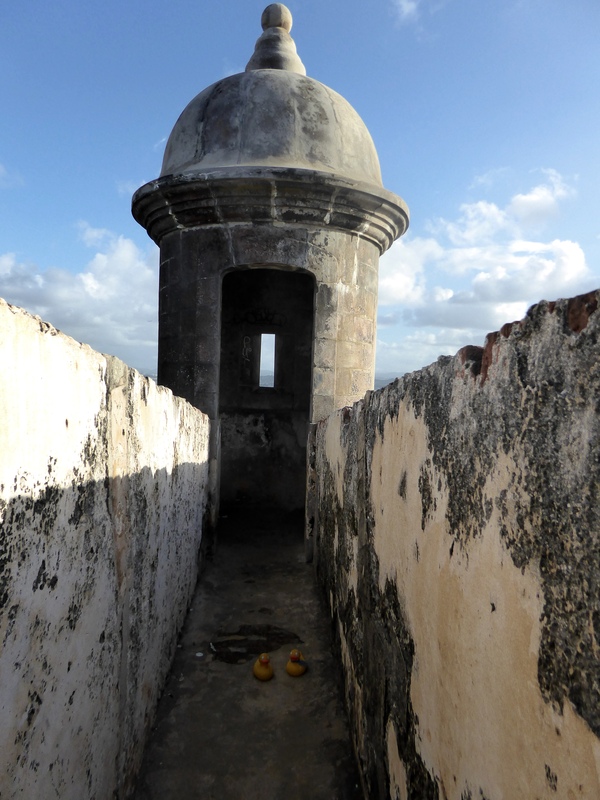 This Castillo has three levels. 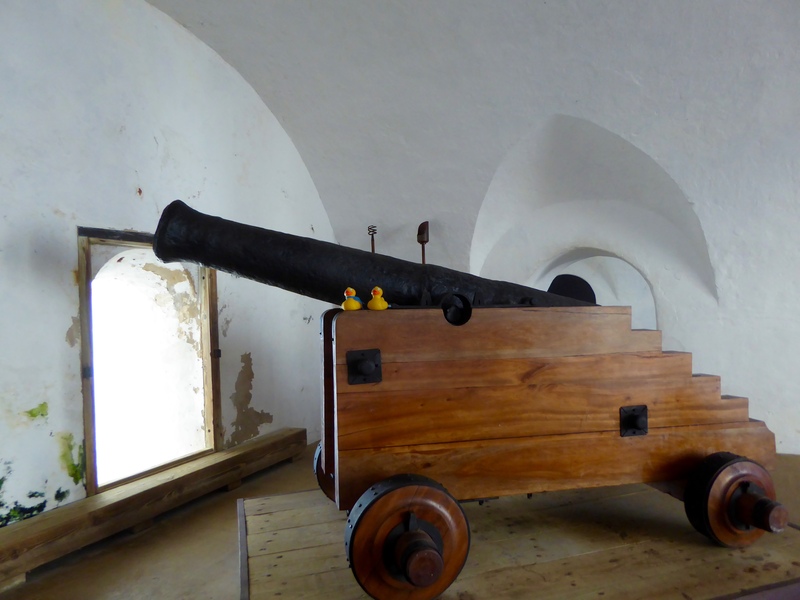 We are on level 1, sitting on the window of the Troops Quarters. Remember that ships sailing from Europe, 4,000 miles to the east, sailed down the coast of Africa where they used the winds and currents to reach Puerto Rico, and then on to the rest of the New World. We are now on the top level, and it is windy here. 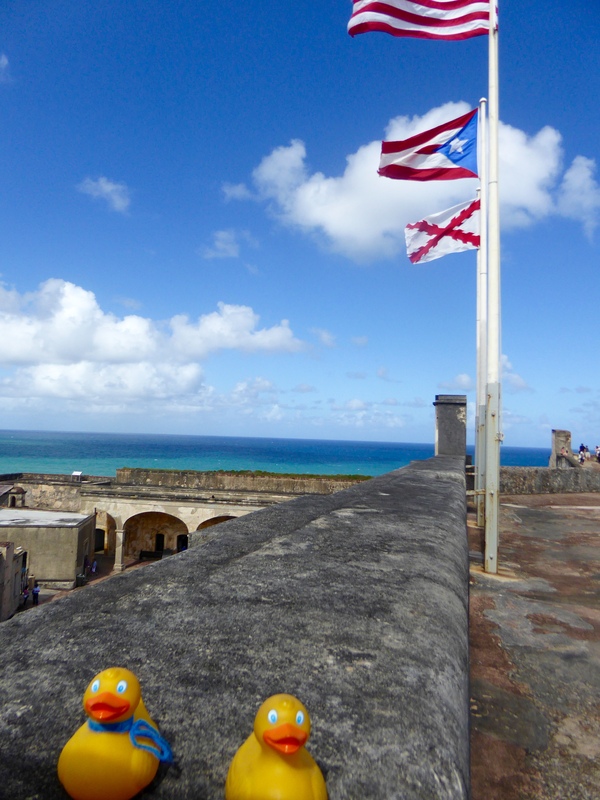 These three flags flew over Puerto Rico. The bottom is the Burgundy Cross. This was the Spanish military flag that flew here during most of the Spanish colonial period. It was adopted in 1506 by Philip the Handsome, King of Castile, to honor his mother, Mary Duchess of Burgundy. 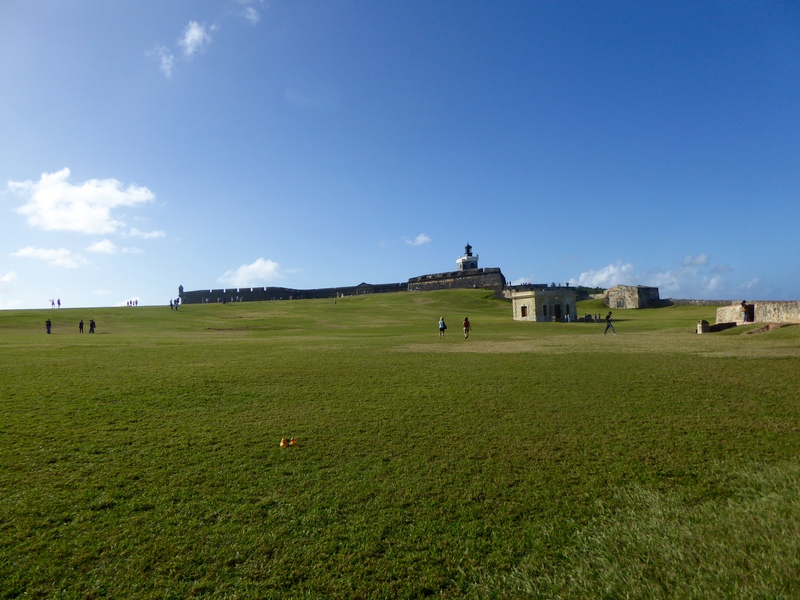 The middle is the flag of the Commonwealth of Puerto Rico. And the top flag is that of the United States of America. 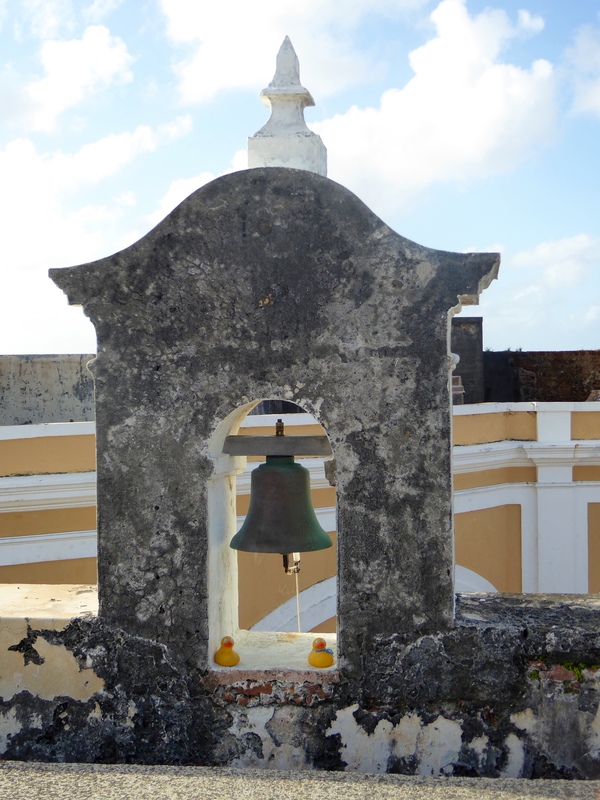 Here is the bell. 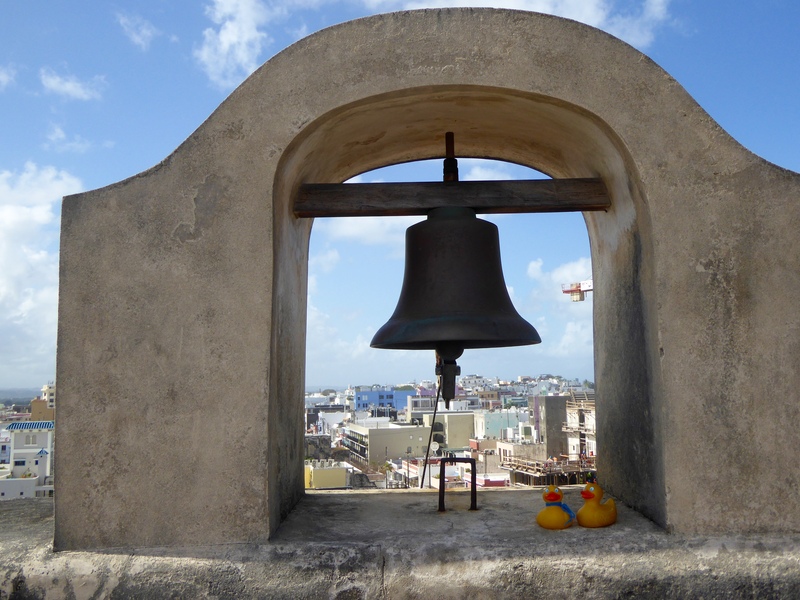 We love the old bells. From here, you would be able to see any approaching threat, by sea or land. 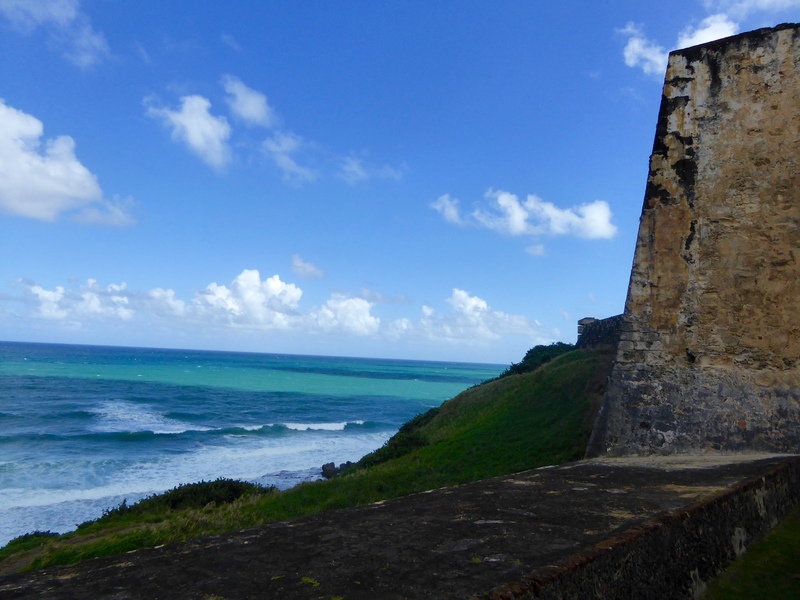 We like this panorama of the coast between the two Castillos. This is a favorite photo from Bucket’s dad. 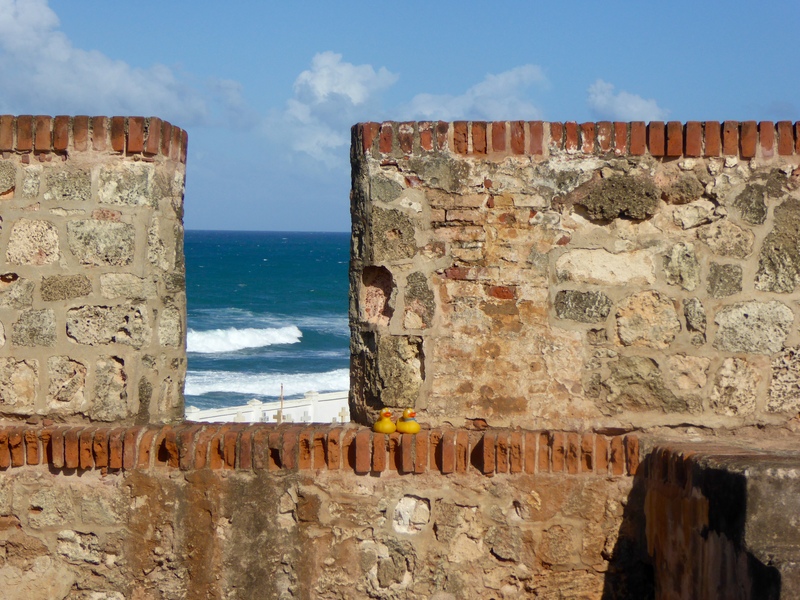 Looking toward Castillo San Felipe del Morro, again we admire the strategic location of these fortresses. 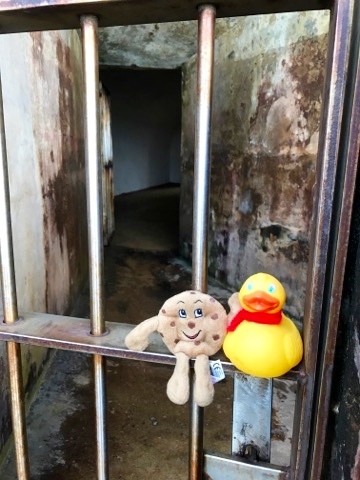 We, the Colorado Traveling Ducks, and humans enjoyed exploring and learning about our history and the Spanish defenses to protect Puerto Rico. 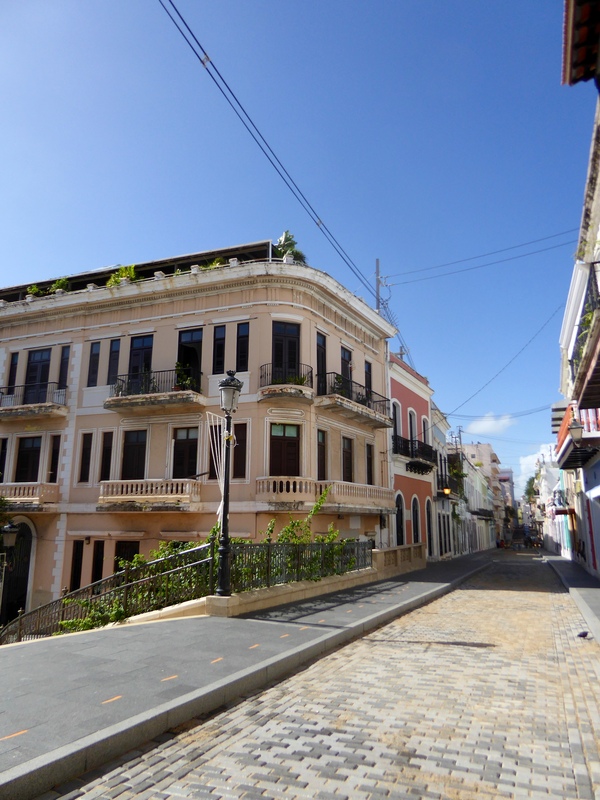 We think you would enjoy wandering through this part of Old San Juan, also. 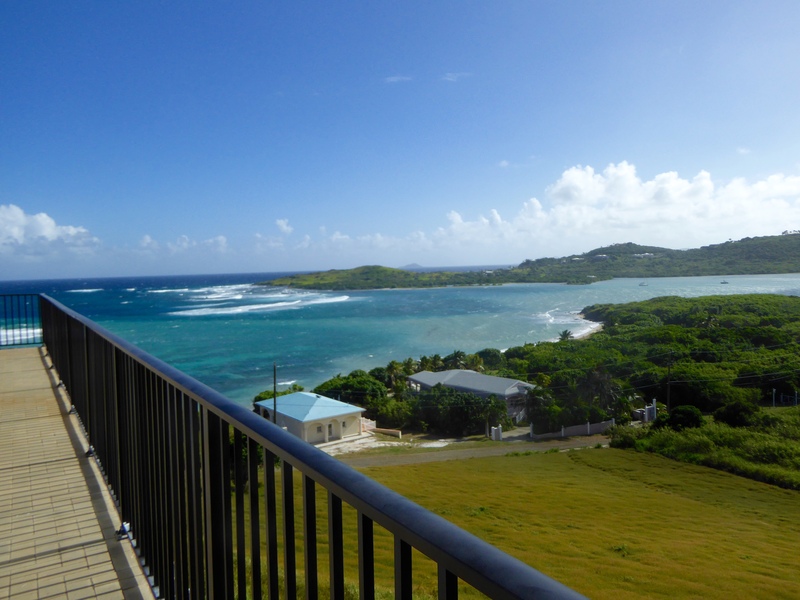 St. Croix is the last port for our cruise. 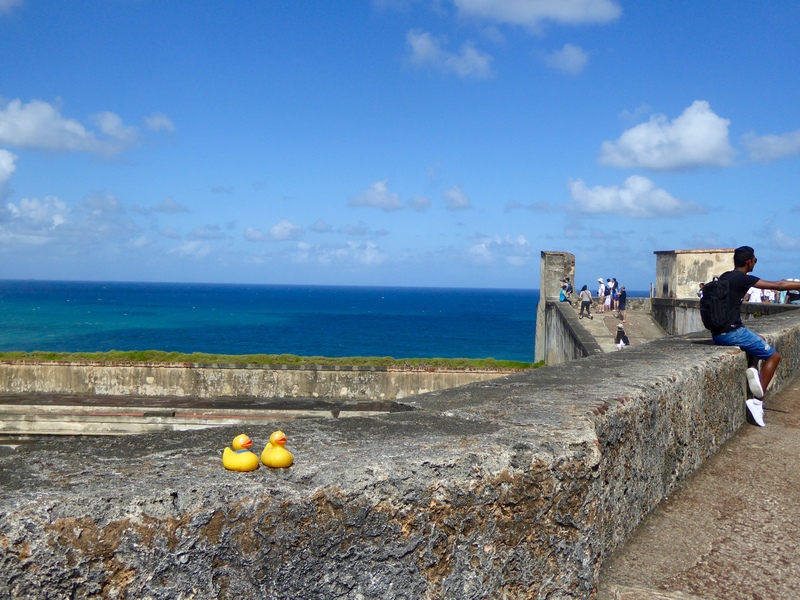 All the humans and ducks took a Scenic St. Croix tour. We like to be together. Leaving the port and through the tropical rain forest our first stop was this Baobab Tree. The Baobab tree is often called “the tree of life”. 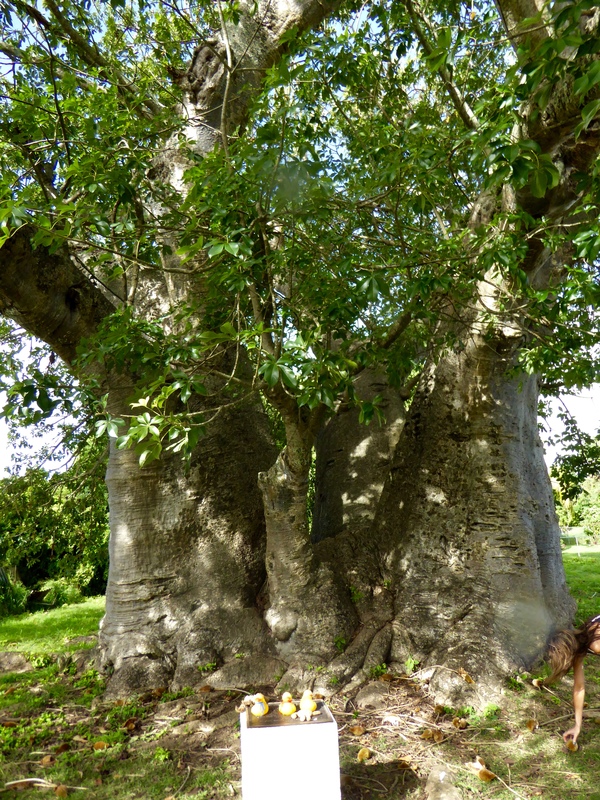 Can you believe the history of this tree? 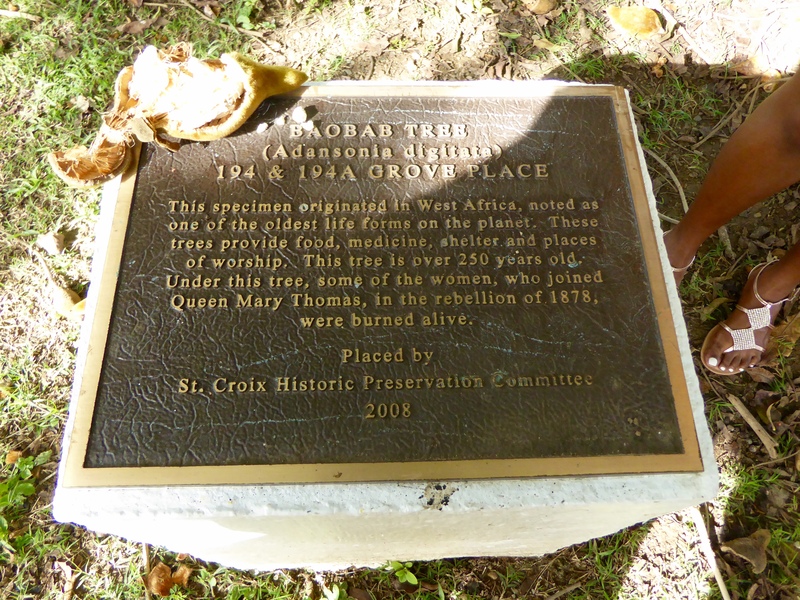 Baobab Tree Burned alive here??? 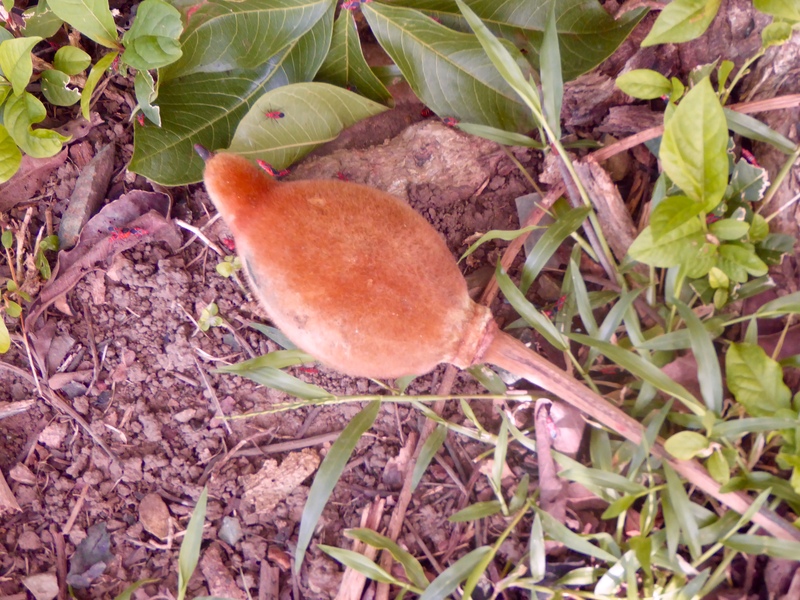 Fruit from the Baobab tree falls to the ground. This feels like velvet. We ducks did not want to sit on the ground. We don’t know these red bugs, and there were a lot of them. Friendly? Biting bugs? We don’t know. 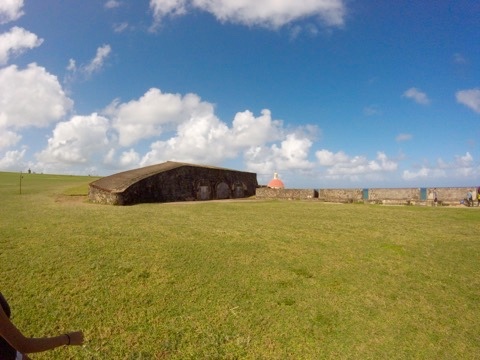 Our next stop was Salt River Bay National Historical Park and Ecological Preserve. 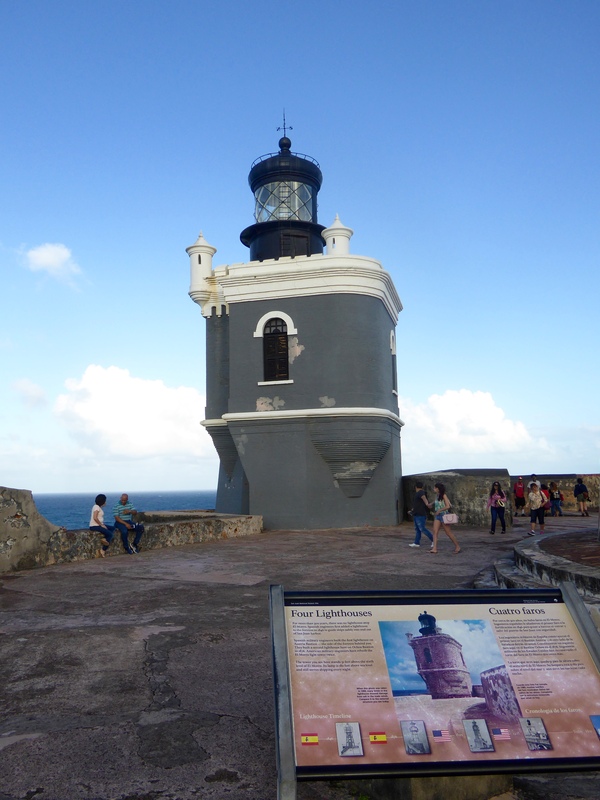 St. Croix is an island in the U.S. Virgin Islands, so this preserve is part of the National Park Service of the United States. 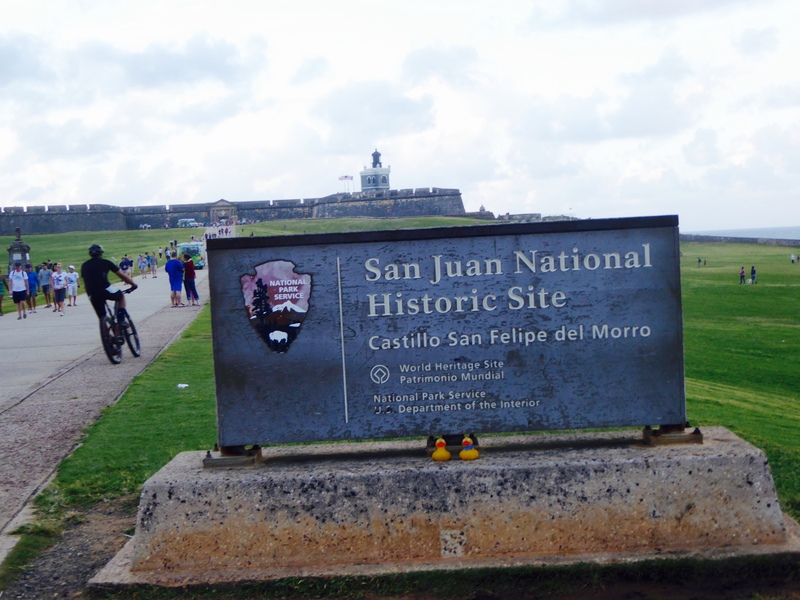 This was the first landing site by Christopher Columbus, in 1493 in the US Territorial waters. The view from the Visitor’s Center was beautiful but it was very windy. 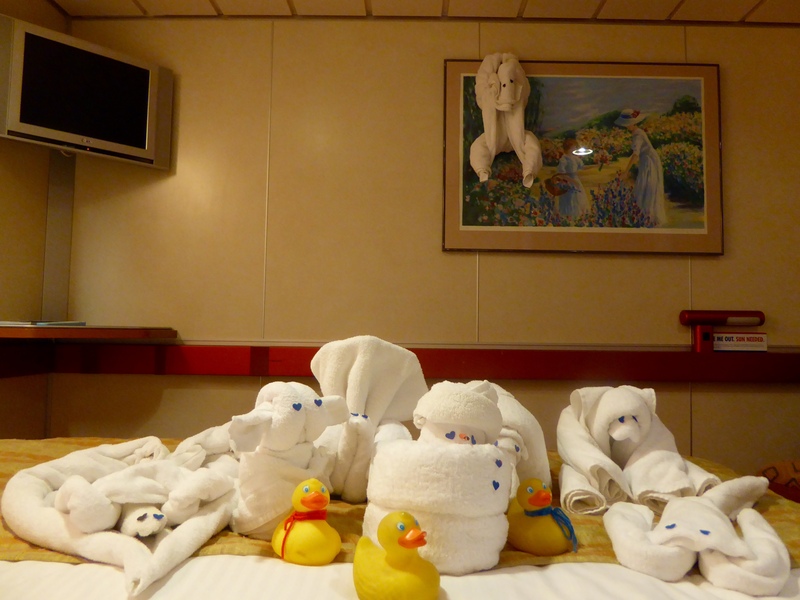 We ducks could not sit here alone. Salt River Bay is home to some of the largest mangrove forest and sea grass beds, providing one of the most unique wildlife habitats, in the Virgin Islands. 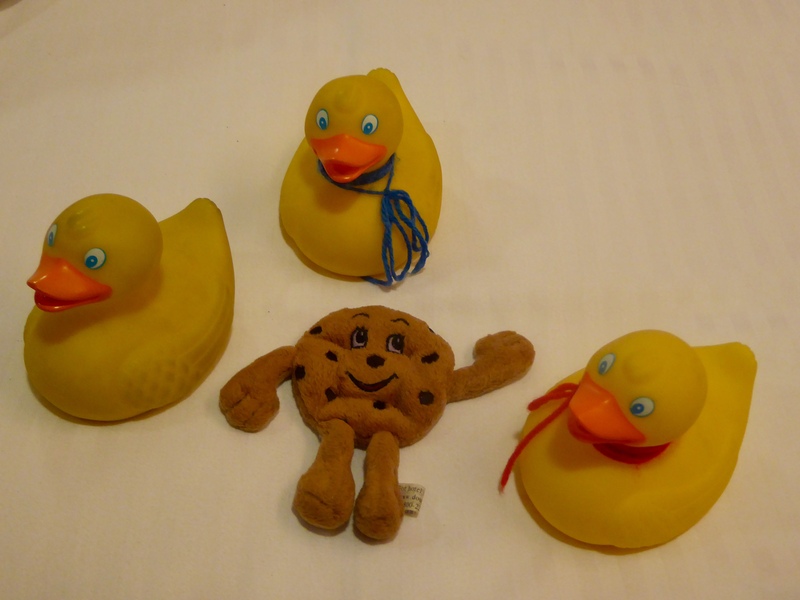 We feel safe with our humans and our friend Chip, the Doubletree Cookie. We love to look at the water. 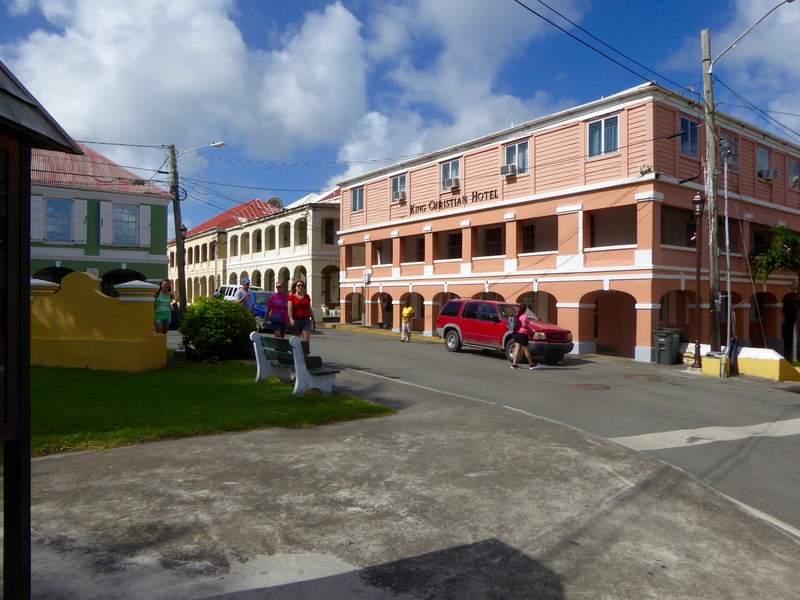 The next and final stop on our tour is Christiansted. 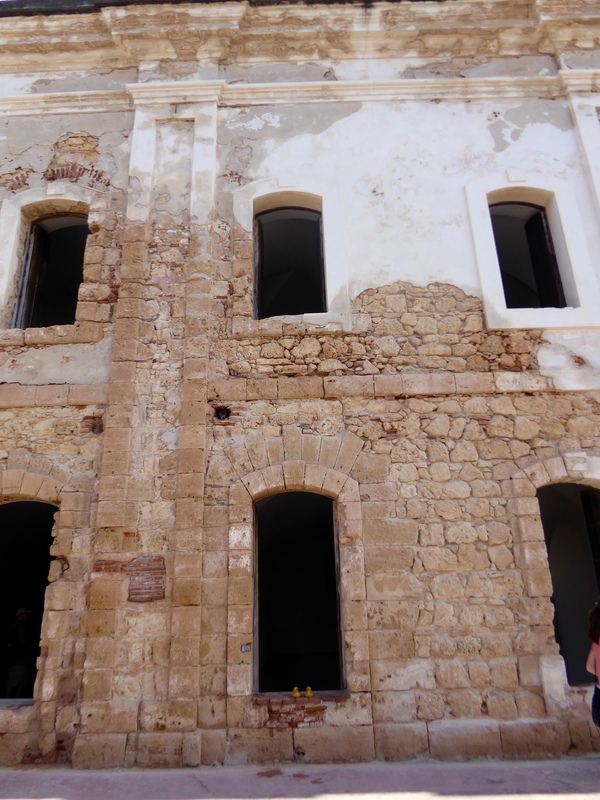 The King Christian Hotel is old and well known. We like these streets and buildings. 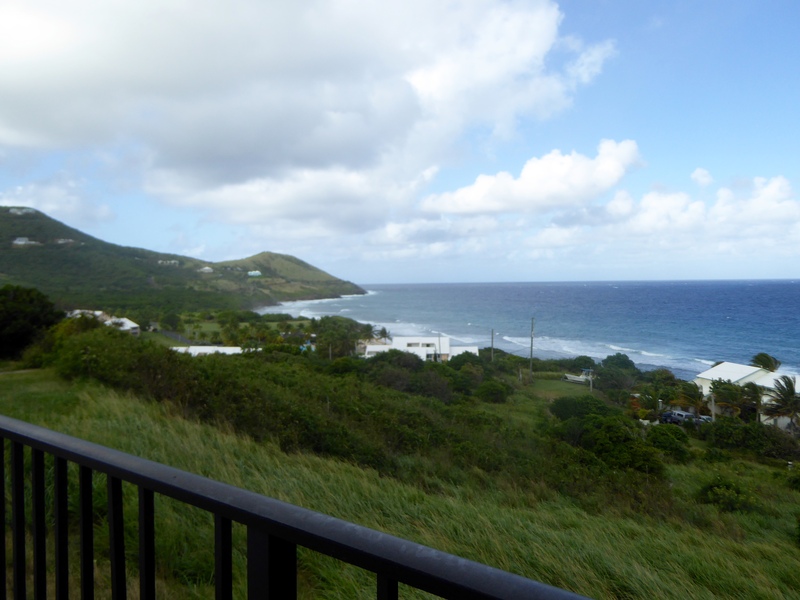 In the early days of St. Croix, sugar cane was grown across the island. 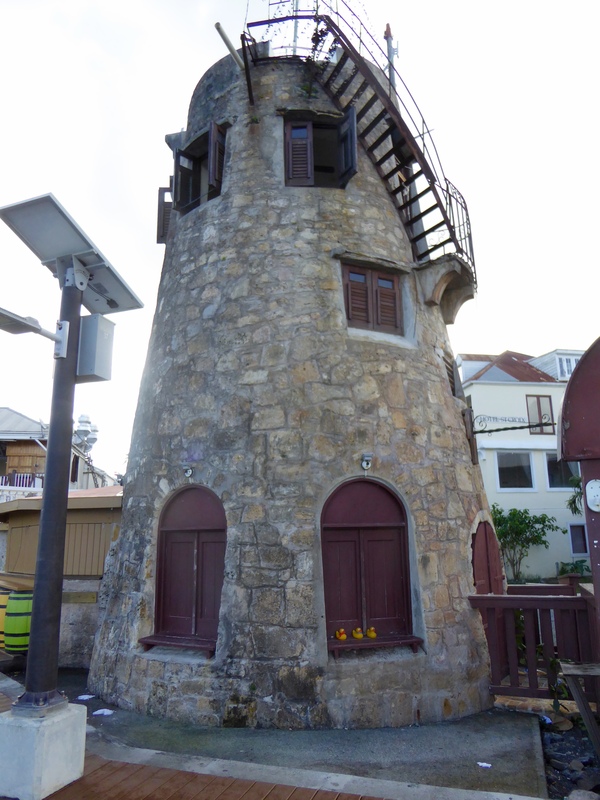 This is an old sugar mill. Looks like a great social place now. We shopped at the Purple Papaya gift shop. 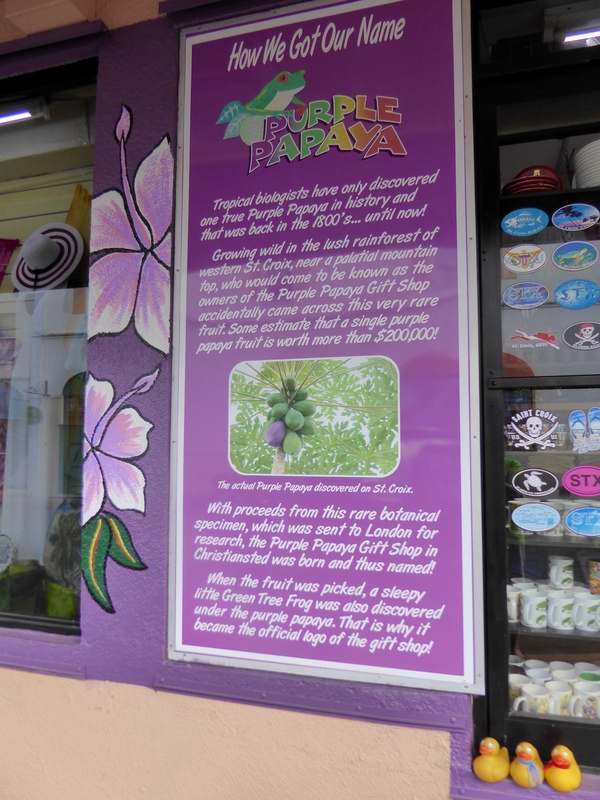 We thought you might be curious about the name, Purple Papaya. 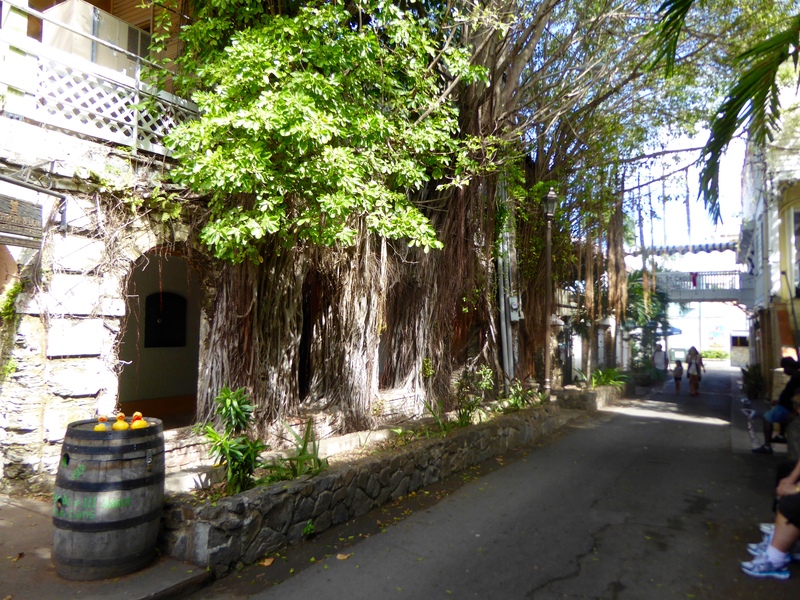 Walking down another street, we were fascinated by all the vines growing from and around these trees. 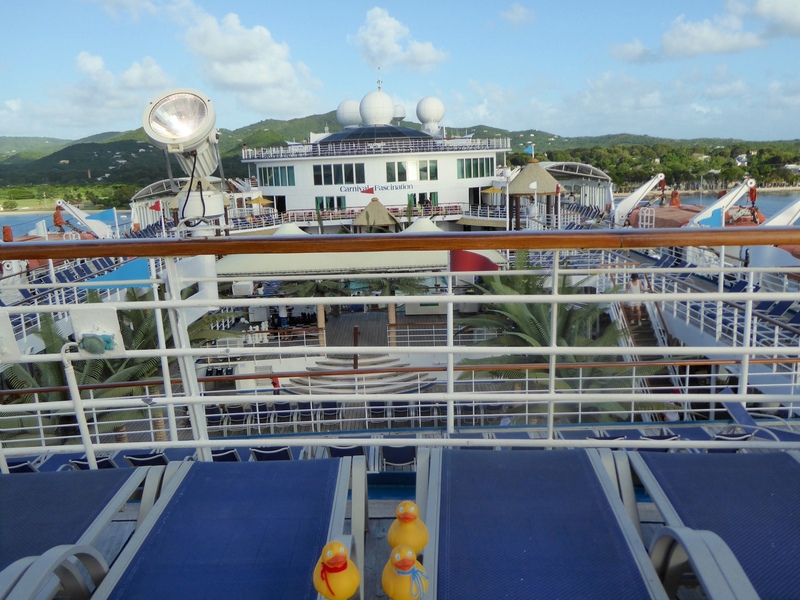 Our tour took us back to the cruise area. 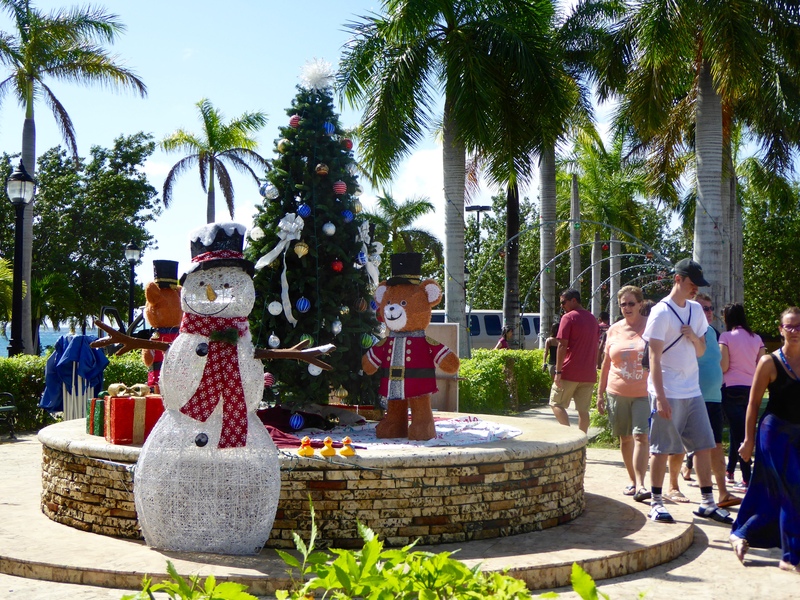 Our shopping area is decorated for Christmas. 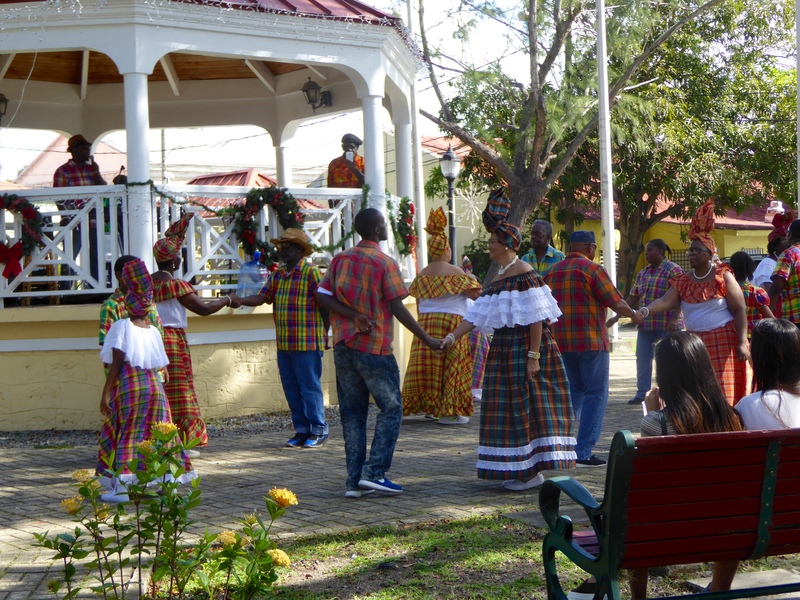 We watched these dancers by the gazebo. The ladies are wearing very fancy hats. 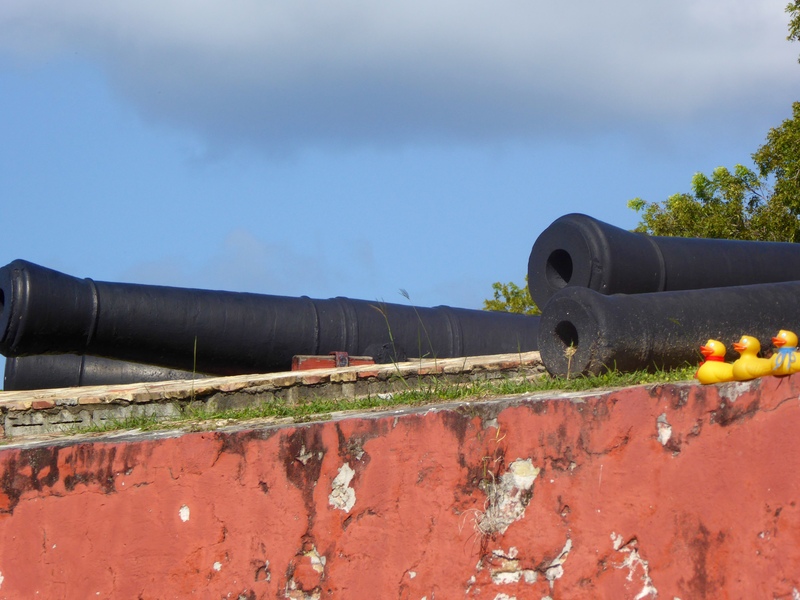 Walking along the Caribbean, we had to stop by the canons. A few more steps and we would be on this beach. 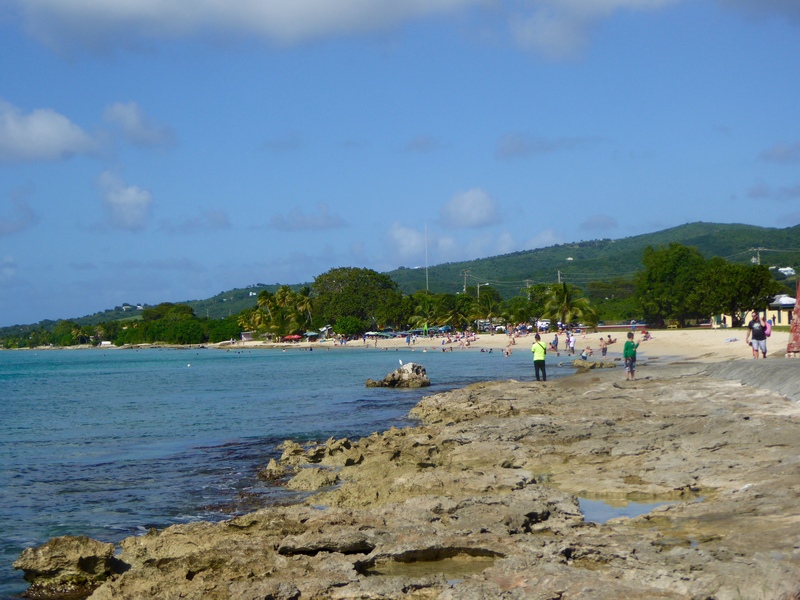 Rocky first and then soft, warm Caribbean sand. Now it is time for us to return to our ship. 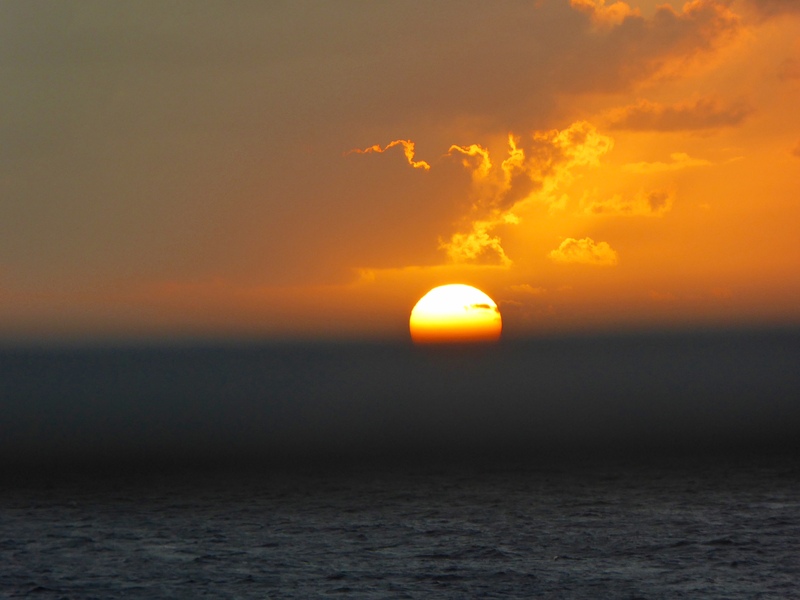 We always must be careful to watch the time and not miss the ship. 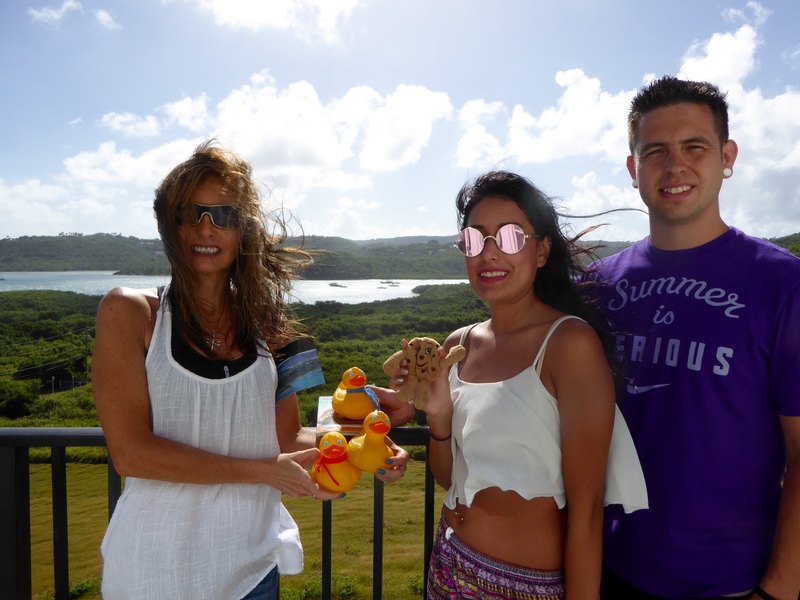 We really liked St Croix and none of us had previously visited this island. We hope to come back soon.